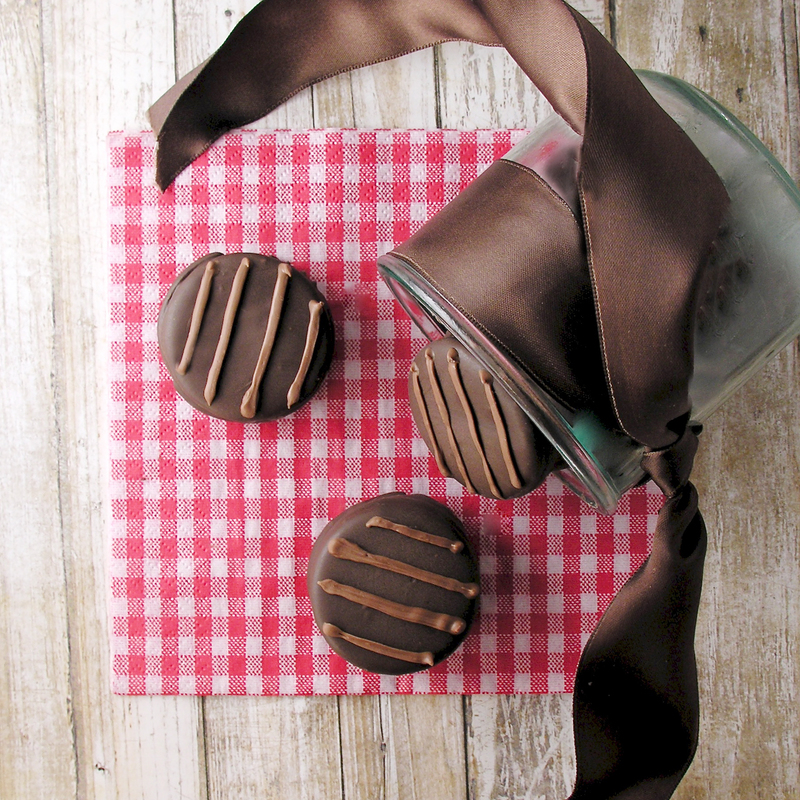 A creamy layer of chocolate chip cookie butter is a wonderful surprise inside these easy chocolate cookies! 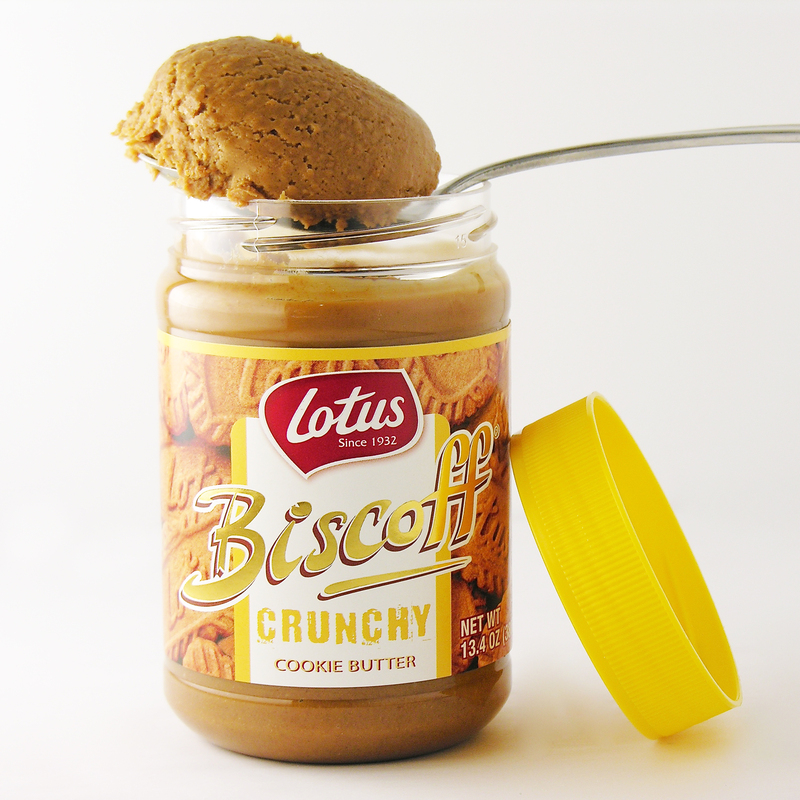 I may be out of the loop on things, but somehow I missed this whole craze over COOKIE BUTTER. When I was in the Czech Republic about a year ago, my friend Angie (the best gift-giver!) sent me home with a collection of European treats. Nestled in with the coffees and chocolates, there was this jar of “stuff” (all the labels were in Czech) and I wasn’t sure what to expect. I know that peanut butter is hard to find in Eastern and Central Europe- so I knew it wasn’t that- but it was close… it was butter- but not made out of peanuts..made out of COOKIES!!!!! Seriously. I fell in love. Then I found it at Wal Mart. Here. In Indiana. #smile!!! These are simply….delicious. I shouldn’t have been surprised that adding cookie butter to Oreos would create such a yummy combination- but I was. The combination is such a unique flavor- and I’m not kidding you- unbelievably good! Plus they are SUPER easy to make. 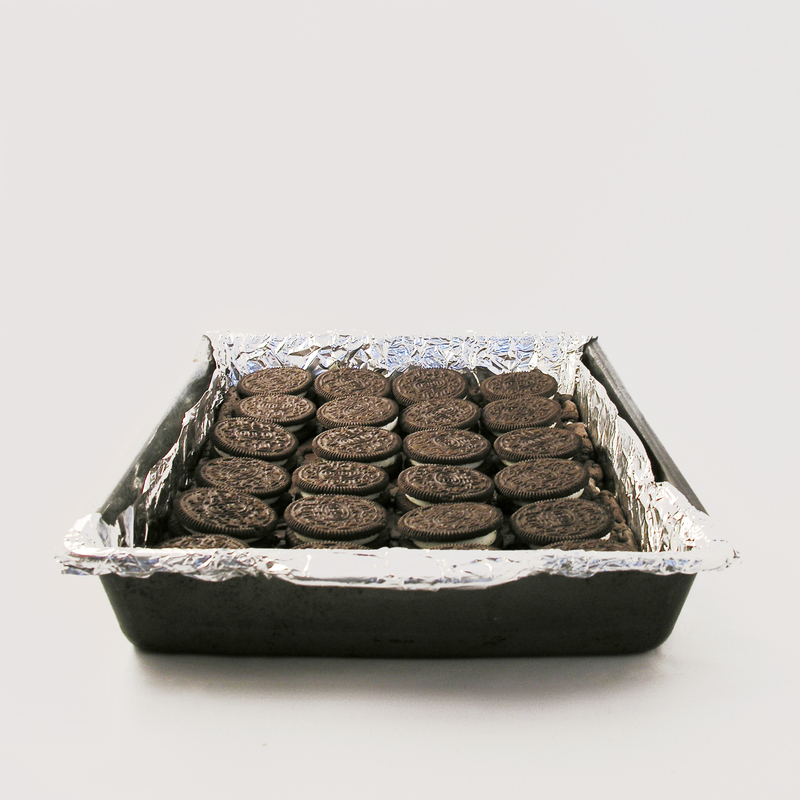 Set half of Oreo cookies on a small tray or sheet that will fit in your freezer. Mix jar of cookie butter and mini chips in a small bowl. 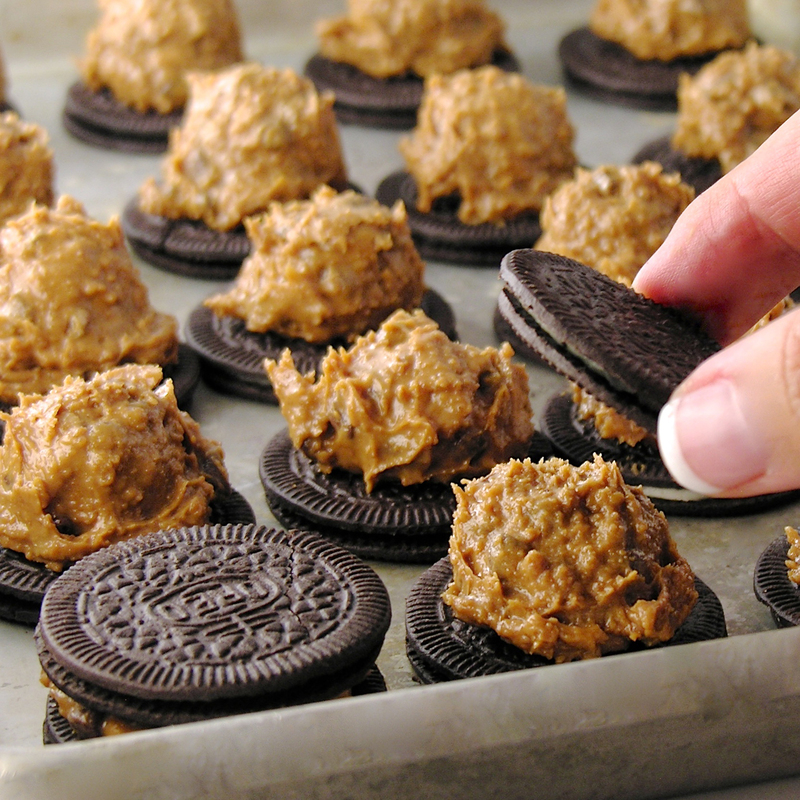 Scoop or spoon cookie butter on top of each Oreo and press a second Oreo on top to make a sandwich. Freeze for about 30 minutes. Melt Candy Melts in microwave, in 30 second increments, stirring in between, until melted and smooth. 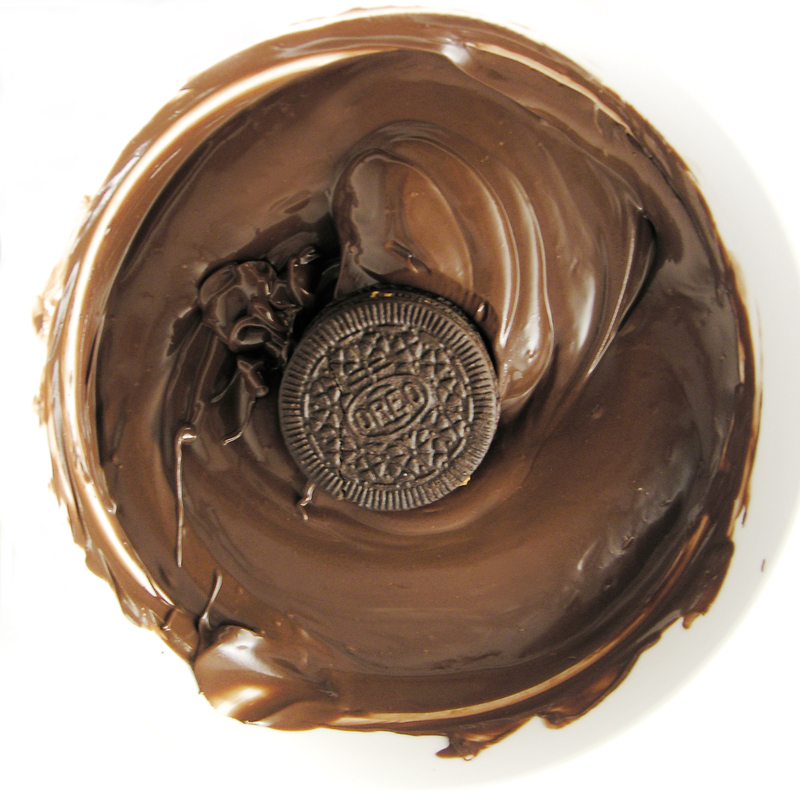 Take 3 or 4 cookies at a time out of freezer and carefully dip in melted chocolate, using a fork to tap excess chocolate off and sliding the bottom of the cookie along the edge of the bowl to remove excess from the bottom. Set on parchment paper to harden. Add sprinkles (if desired) before chocolate hardens, or after it hardens, drizzle or pipe a little bit of contrasting chocolate across the top of each cookie. 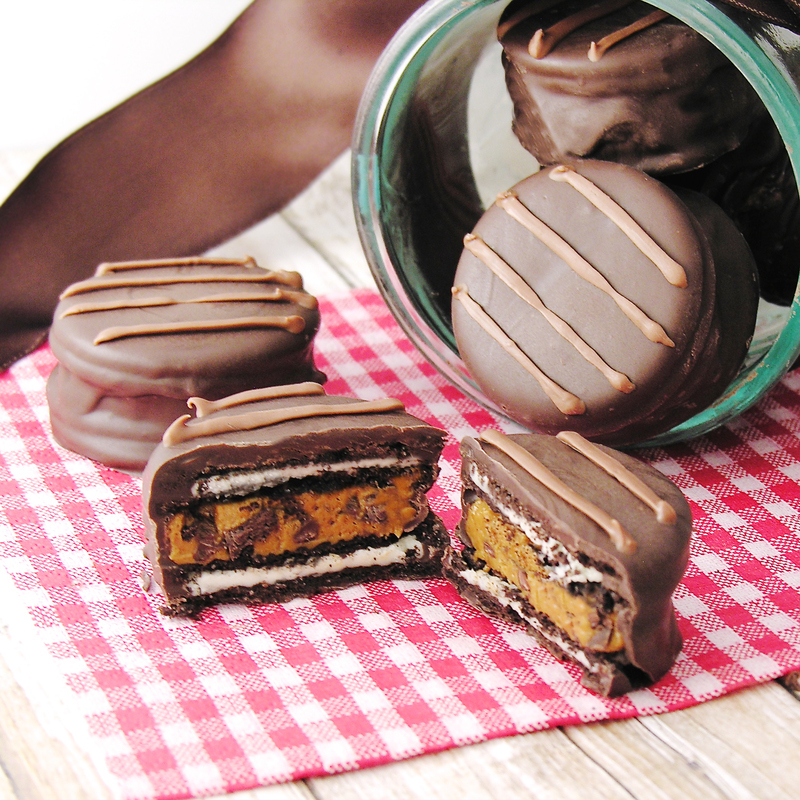 Posted in Candy, Cookies, Easy recipes and tagged chocolate, chocolate chips, chocolate cookies, chocolate dipped cookies, Chocolate dipped Oreos, Christmas cookies, Cookie Butter, Cookie butter recipe, cookie ideas, cookie recipe, cookies, dessert, dessert recipe, Fall Cookie recipe, oreo ideas, Oreo Thins, Oreo This recipe ideas, Oreos, recipe, unique cookie recipe. Bookmark the permalink. 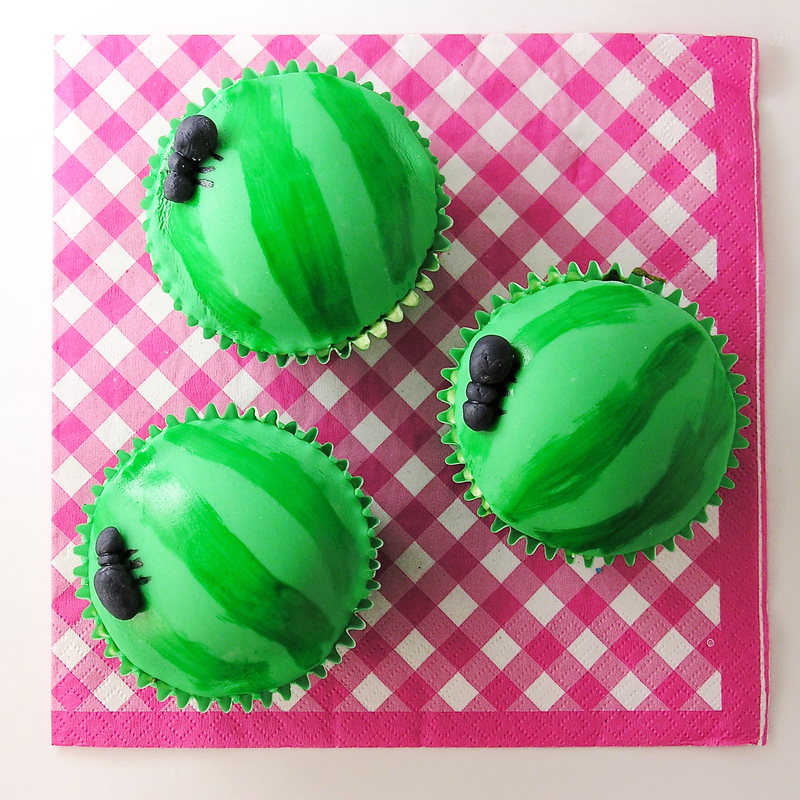 What could be a better picnic treat than these sweet watermelon cupcakes~ covered in “ants” and filled with chocolate chip seeds??? I also used fondant on the top of these cupcakes. I know that for many of you, this step is a tedious one and I say frost these cupcakes however you like! 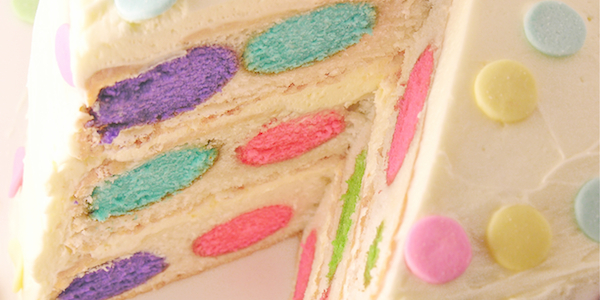 Green frosting, pink frosting with sprinkles of mini chips….whatever! Just don’t miss out on that fun center! Remove one cup of batter and place in a separate bowl. Add green color gel to remaining batter, mixing well. 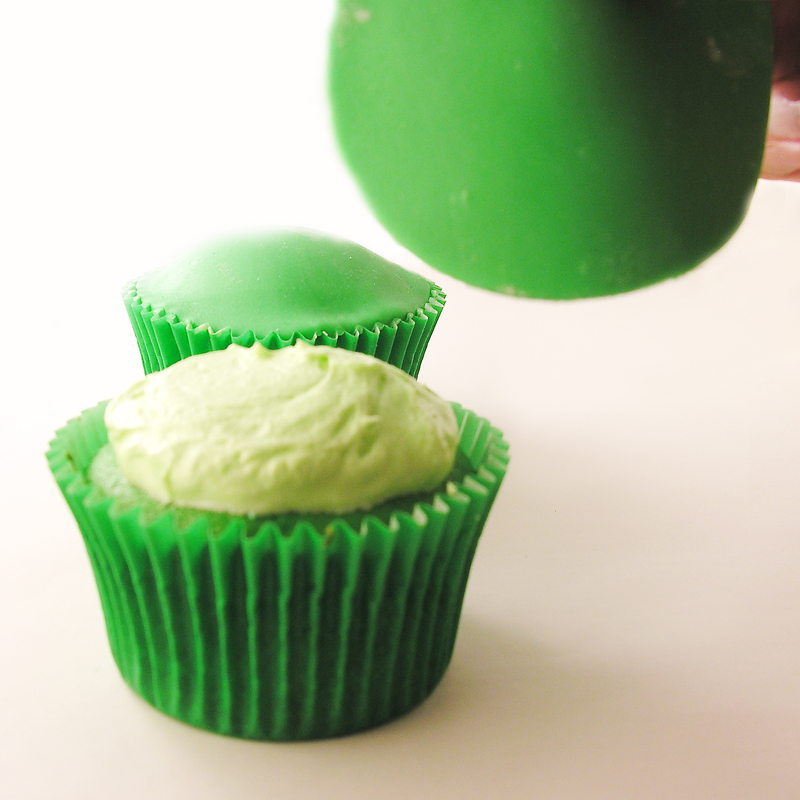 Spoon a little green batter into a cupcake liner, placed in a cupcake tin. 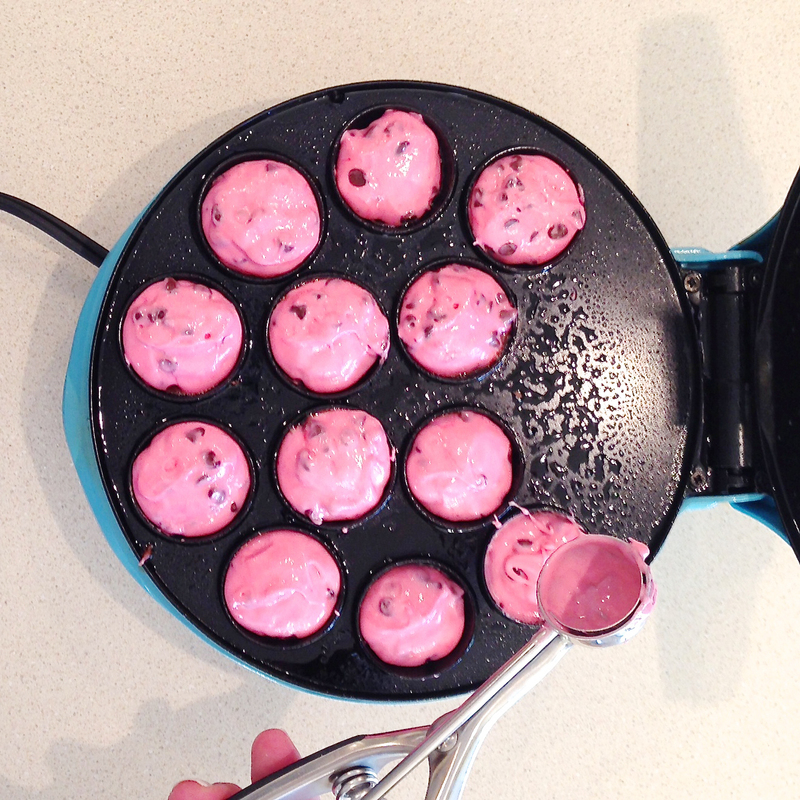 Place pink cake pop on top. Spoon green batter over the top, covering the cake pop. Use less, rather than more batter here- if you use too much it will bake over the edges. Bake at 350F degrees for 15-18 minutes. Make frosting by placing butters, powdered sugar and vanilla in a large mixing bowl and beating on high for 3-4 minutes until very light and fluffy. Color frosting green, if desired, and set aside. 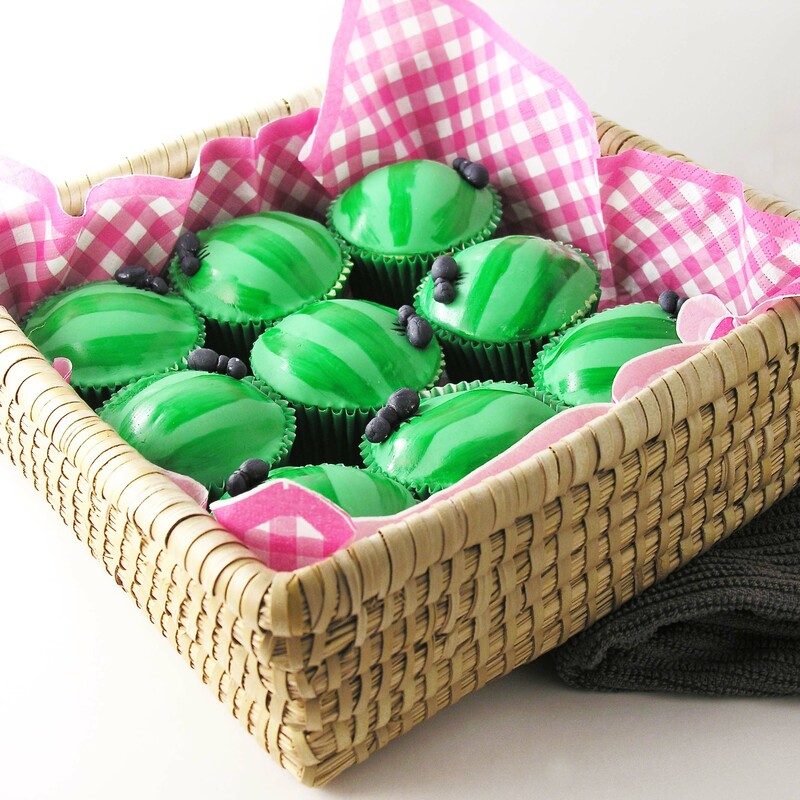 IF you use fondant, color a batch with green color gel (leave out a little bit to make ants if desired), cut into circles that fit the top of your cupcakes using a round cookie cutter. Keep circles covered to prevent drying. Working one cupcake at a time, spread frosting and then gently lay fondant on top of frosting and press edges down inside of cupcake liner. 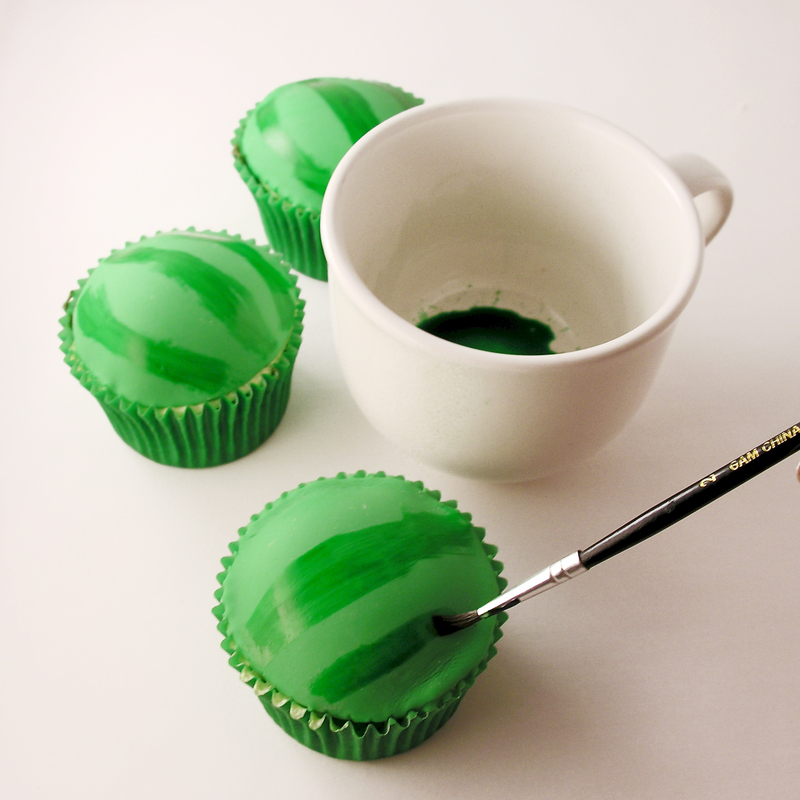 Use dark green color gel with a little water (think watercolor paints) to paint on watermelon stripes. 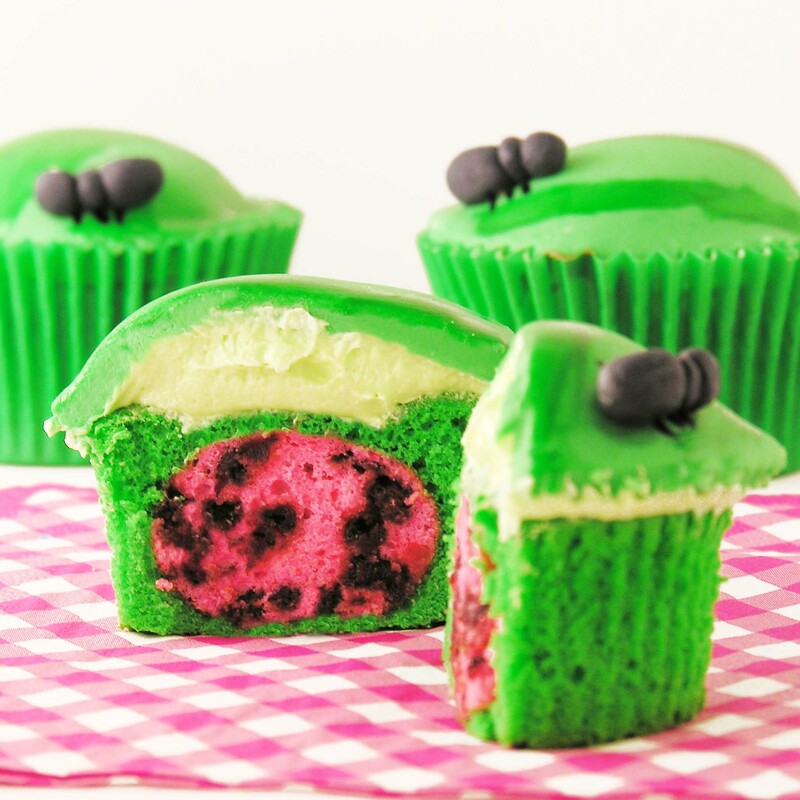 Color remaining fondant black and roll into 3 small balls to stick together as an ant on each cupcake. use a toothpick or small brush to paint little ant legs under each ant. My thoughts… These are really fun little cupcakes. I’m not a huge fan of watermelon flavor, but only the center is flavored and for me it was the perfect little surprise “pop” of flavor. 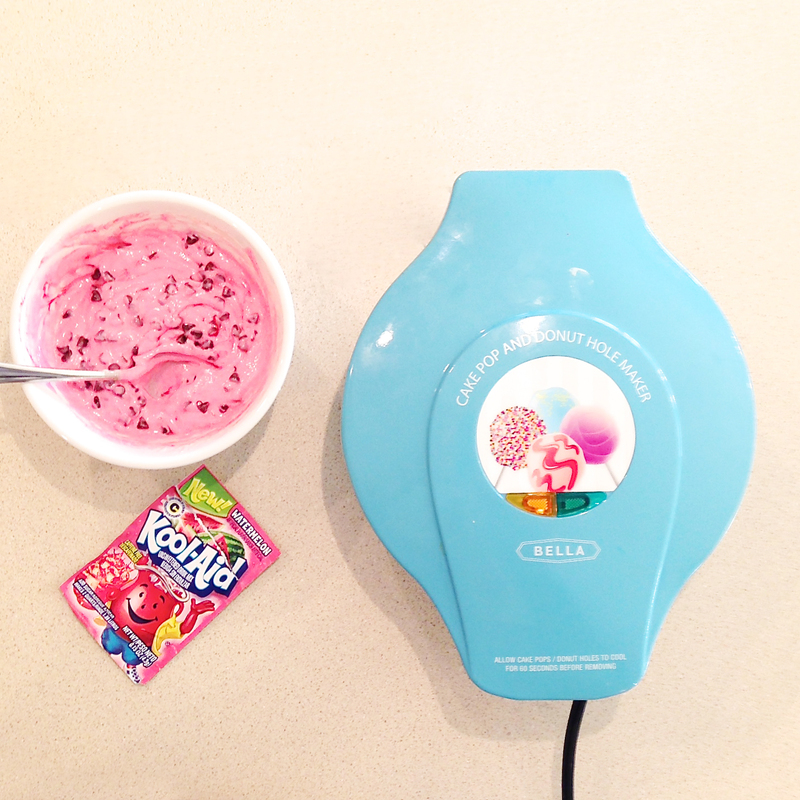 You could certainly add Kool-Aid to your frosting too- it will just end up being a little pink, rather than green. Posted in Cupcakes and tagged best, cake pop machine, cake pops, chocolate chips, cupcakes, filled cupcakes, fondant, fun, Kool-Aid dessert, Kool-Aid recipe, picnic treats, recipe, Summer recipe, watermelon, watermelon cupcakes, Watermelon Kool-Aid. Bookmark the permalink. 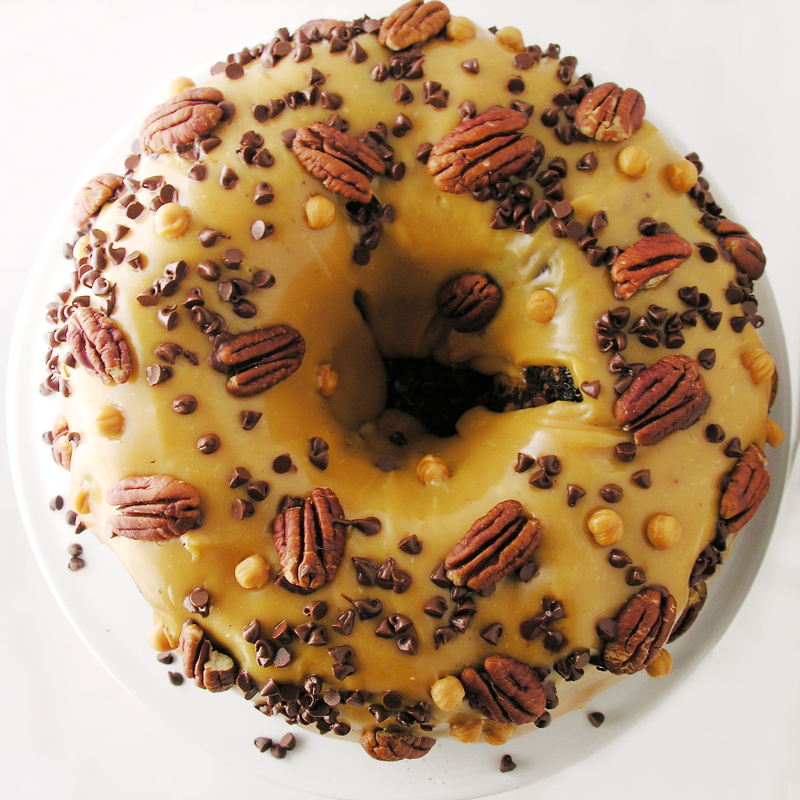 Swirls of caramel and chocolate cake, topped with caramel sauce and pecans, make this a beautiful and decadent dessert! I love bundt cakes. They are just so pretty and fun to serve. 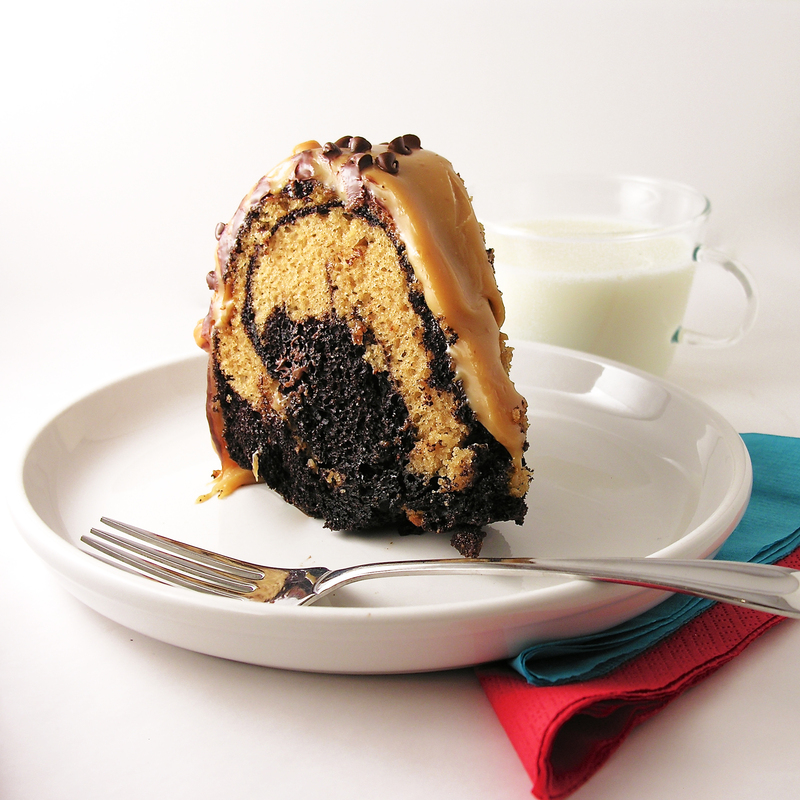 This one is a combination of caramel and chocolate in a memorably beautiful and tasty display of yumminess! 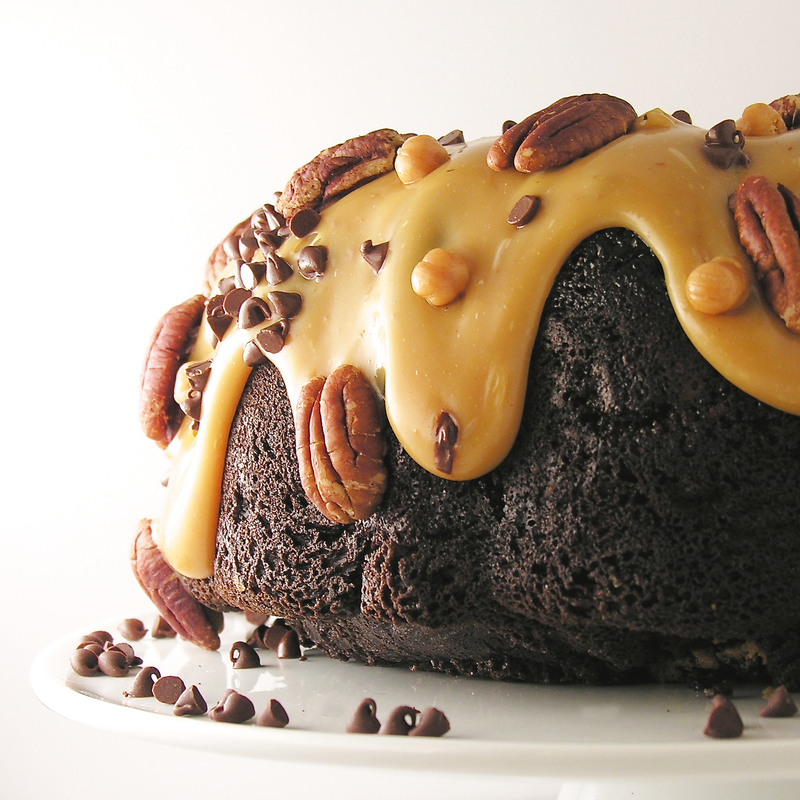 This uses cake mixes and Kraft caramels, so it is a quick and easy dessert to put together, and it serves a ton of people, 14-16 at least. I also added some Kraft caramel bits as sprinkles because I had them and they sounded fun- those are the little round caramel bits you see in my photos. Make up both cake mixes according to package. Alternate pouring them into a well-greased bundt pan. Fill the pan only 3/4 full. You will have a little cake mix left at the end, since both mixes don’t fully fit in the pan. Place on a cookie sheet (just in case of overflow) and bake for 40-50 minutes. 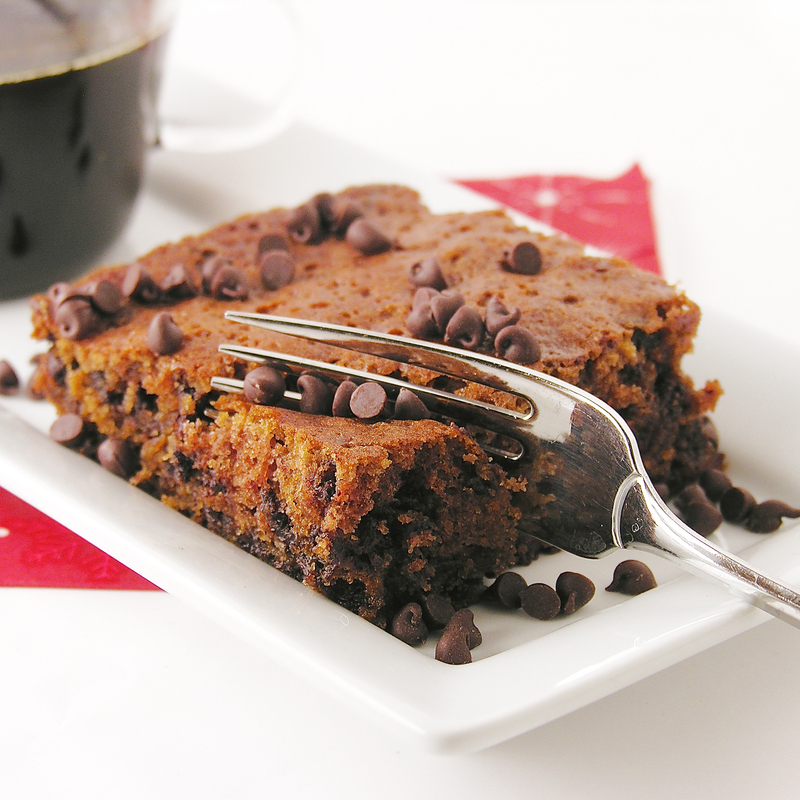 A cake tester or skewer should come out clean when cake is fully baked. 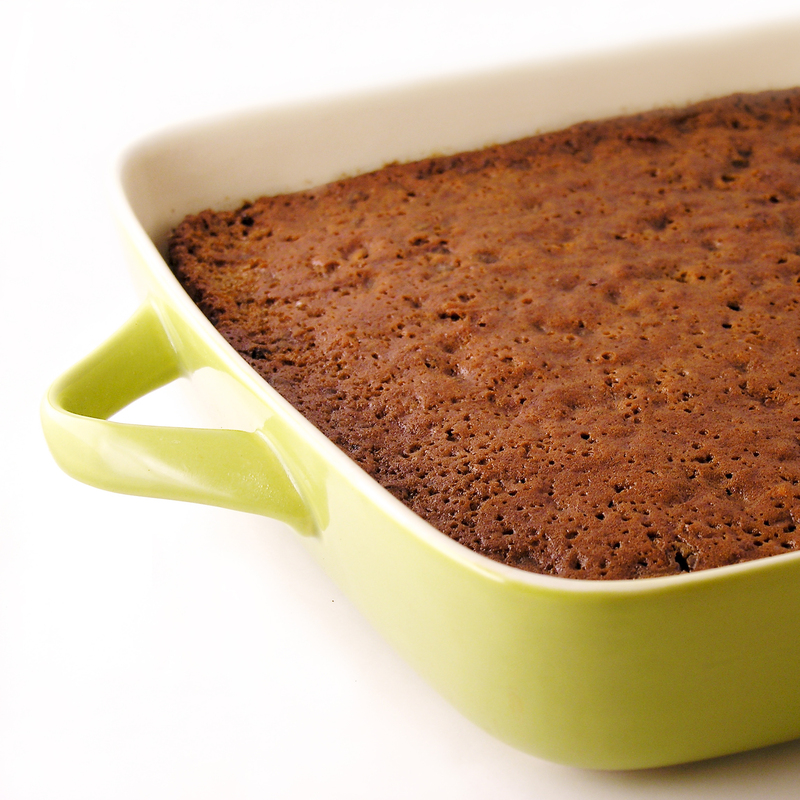 Allow cake to cool for 5-10 minutes in pan, and then tip onto a wire cake rack to finish cooling. While cake cools, make caramel. Place unwrapped caramels into a medium saucepan with sweetened condensed milk and butter. Heat on medium/high, stirring constantly, until caramels are completely melted and smooth. 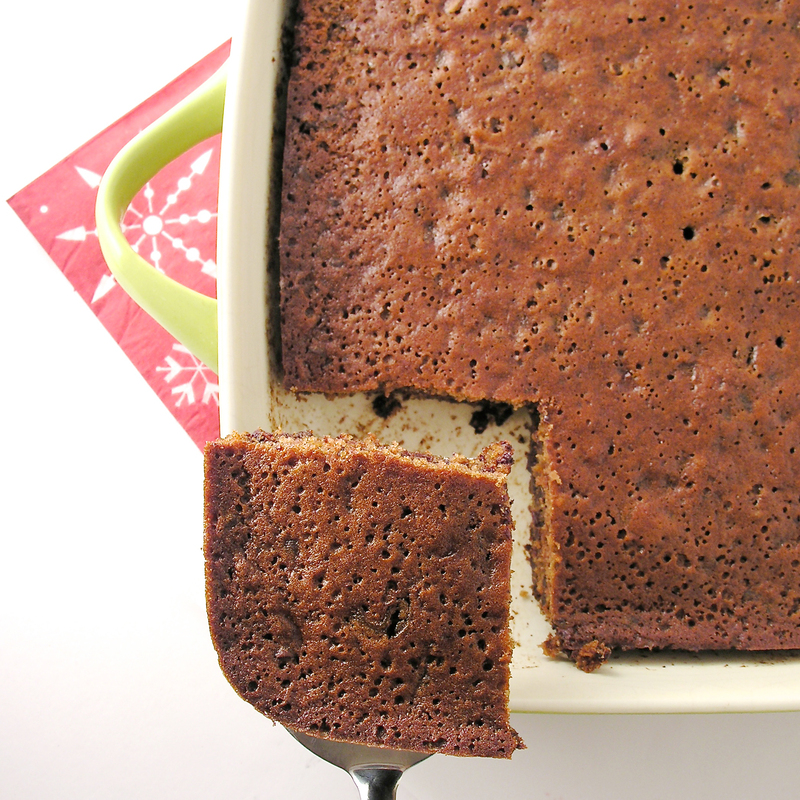 Place cake on serving plate. 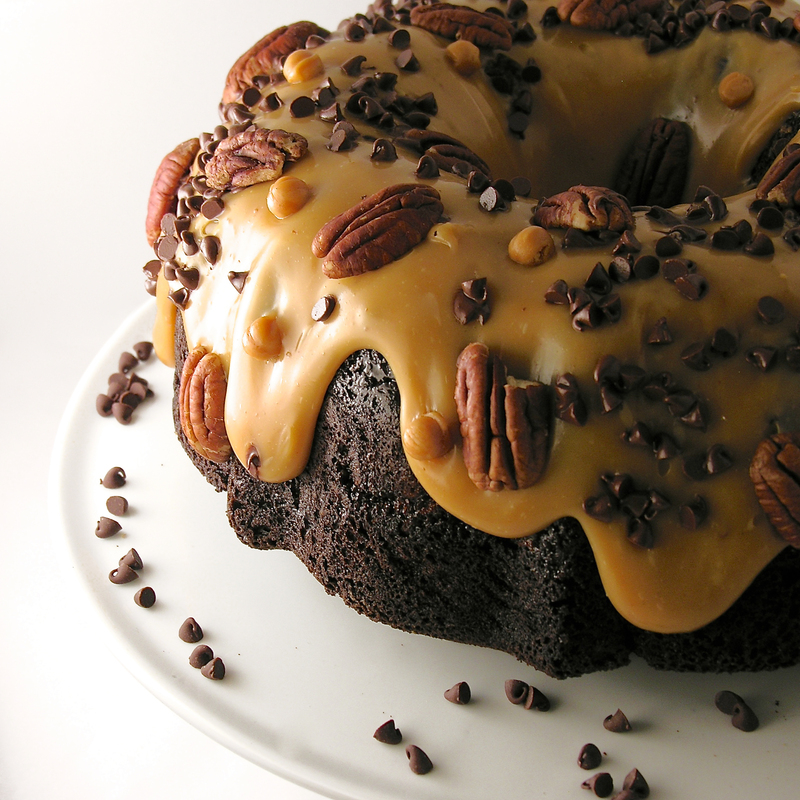 Pour caramel sauce over the bundt cake, allowing it to run down the sides. Immediately sprinkle with nuts and chocolate chips. If you wait these will not stick to the caramel as it hardens. 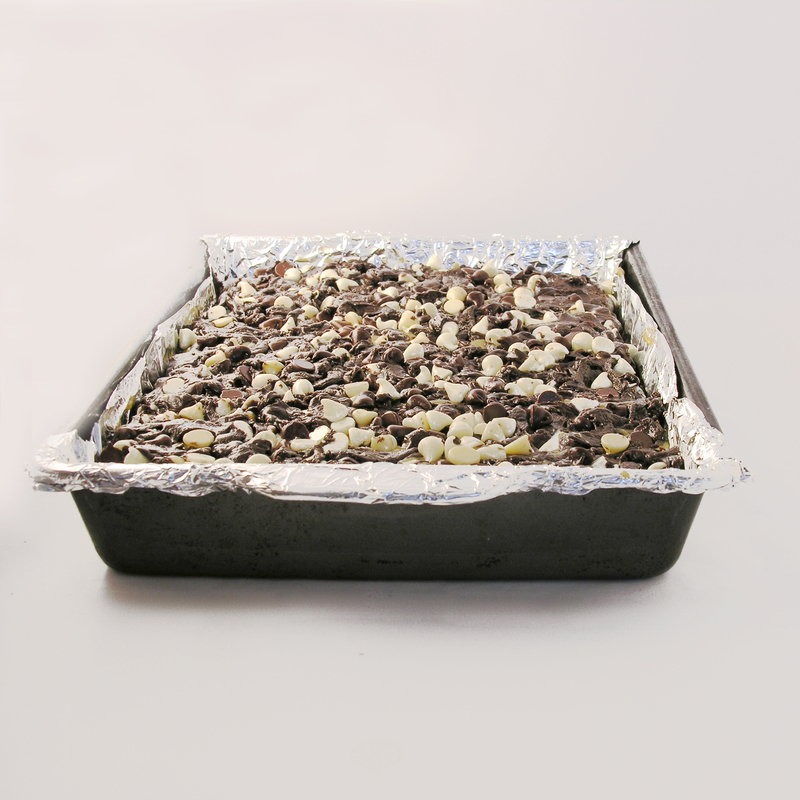 Allow topping to cool and firm up before cutting. My thoughts: This is such a moist cake, and if you aren’t a big fan of frosting this is perfect- no frosting at all- just a soft caramel. It’s a perfect fancy dessert that is so quick to make, and fun to serve! 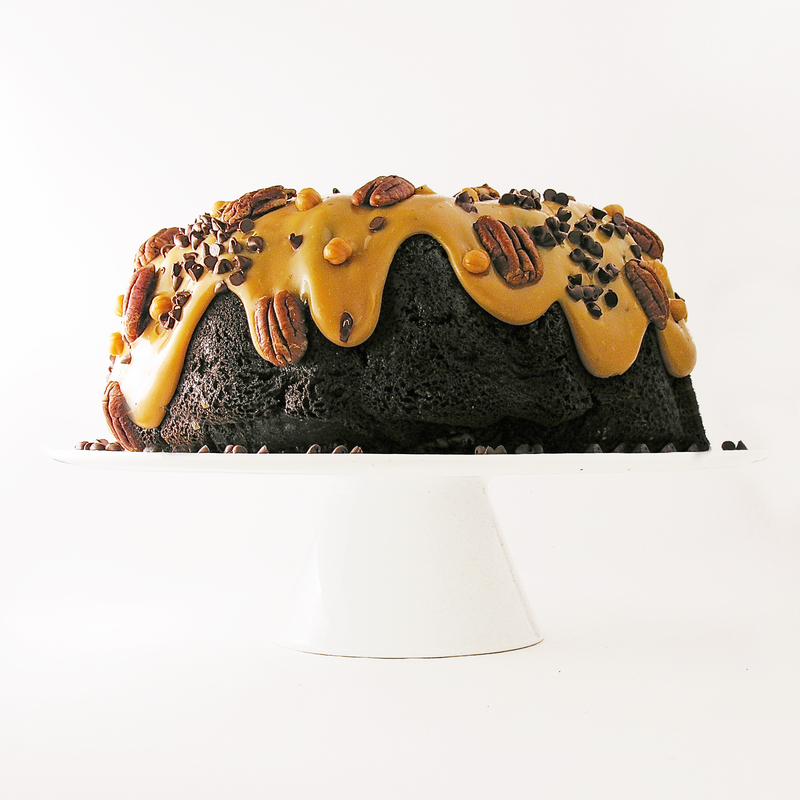 Posted in Cakes and tagged best, bundt cake, cake, caramel, caramel bundt cake, caramel cake, caramel sauce, chocolate cake, chocolate cake mix, chocolate chips, dessert, easy, elegant dessert, Kraft caramels, pecans. chocolate, recipe, turtle bundt cake. Bookmark the permalink. 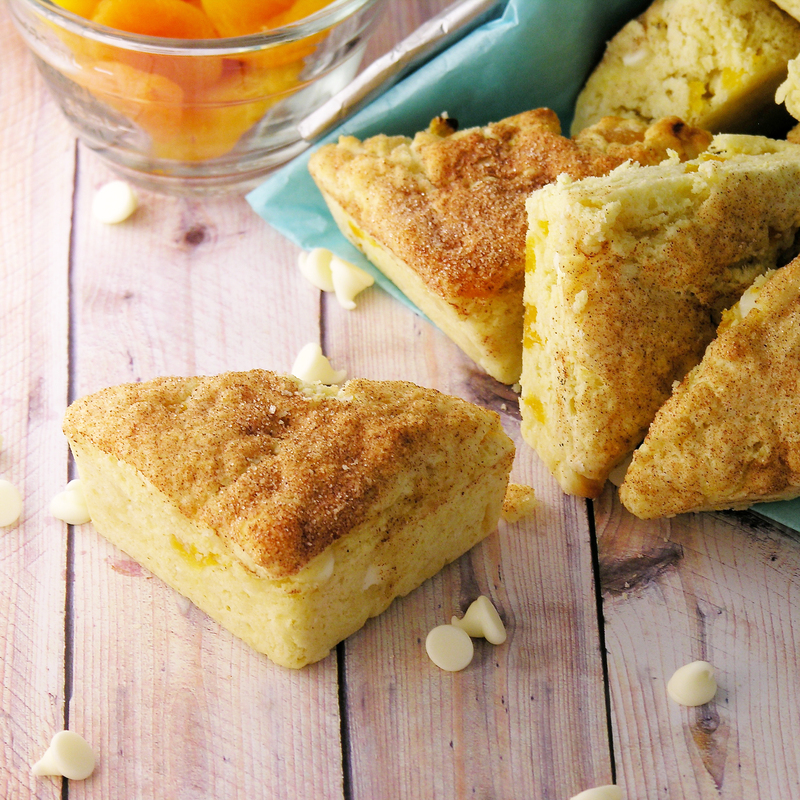 These dense, rich scones can be made with a variety of flavors, and they are SO good! One month ago I could say that I had never even tasted a scone before, much less made one. 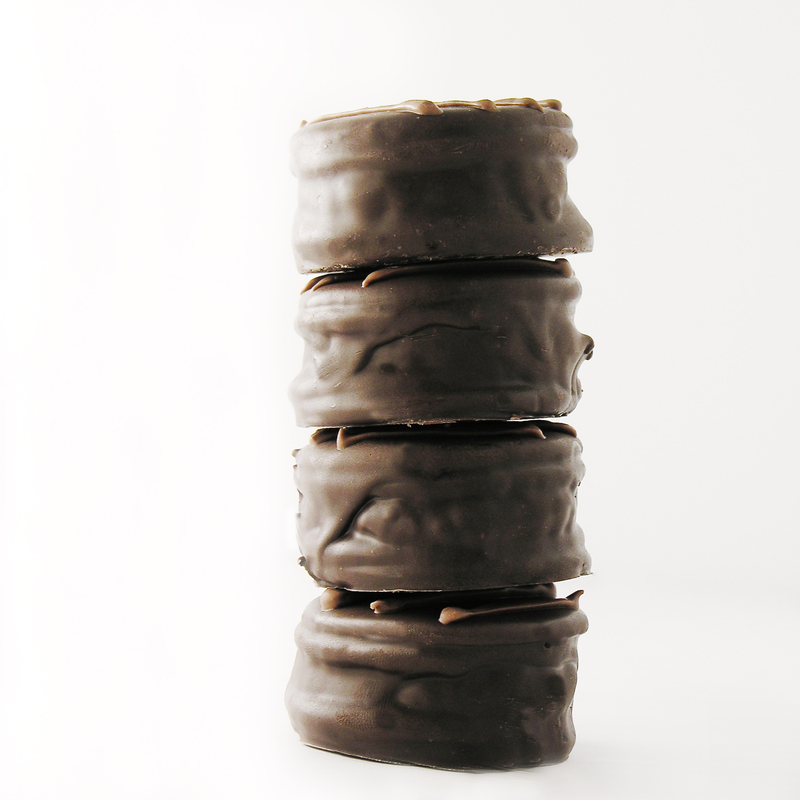 Today I made nearly 80 of them and they are one of my new favorite treats! 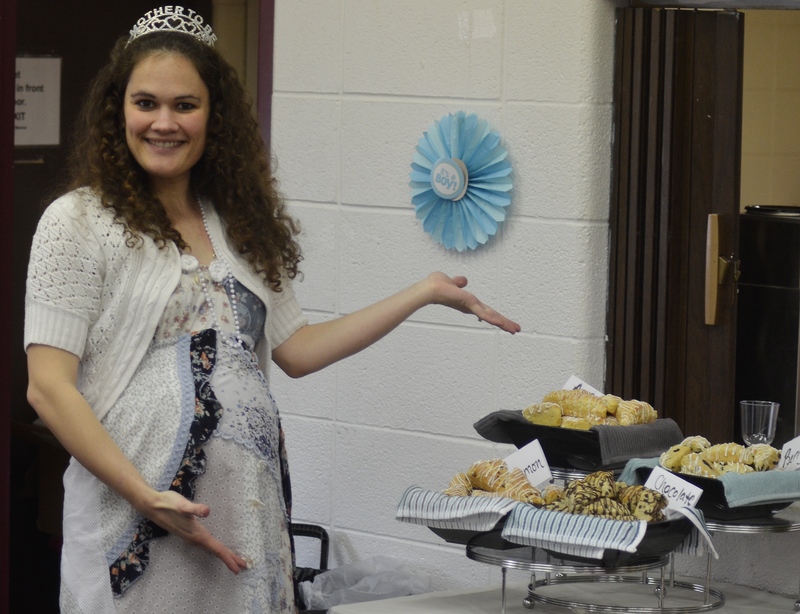 About a month ago, I offered to help with a baby shower for my friend Heather. I asked if they needed help with food, thinking cake or cupcakes or fancy cookies- typical shower requests. Heather’s mom Sharla explained that they were having an English tea for Heather and could I please make scones? Scones…? I agreed and started to read up on scones. They sounded difficult. 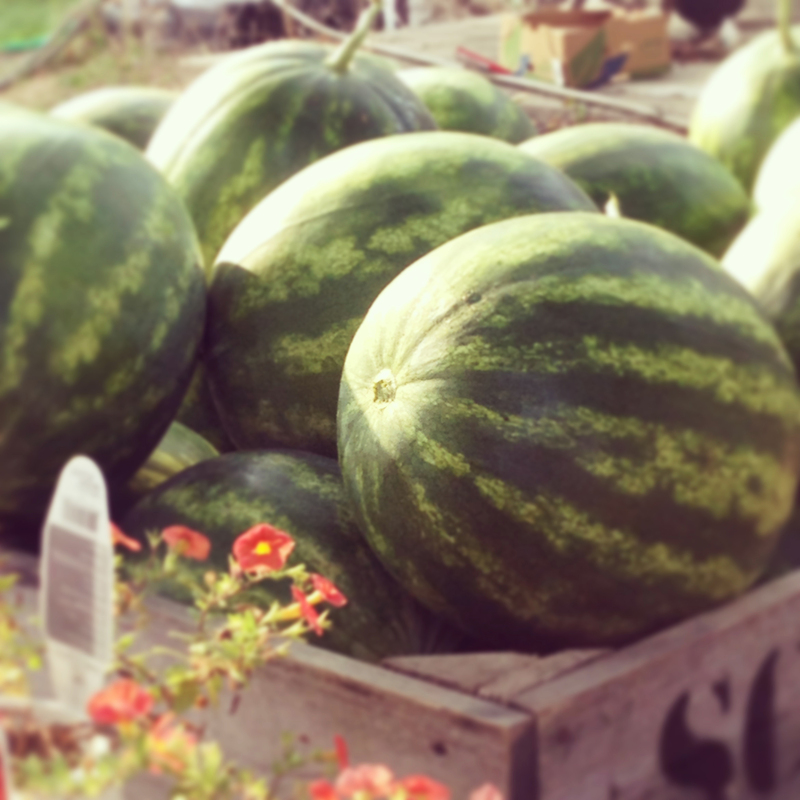 They sounded dry and crumbly and b-o-o-o-ring…. yawn. 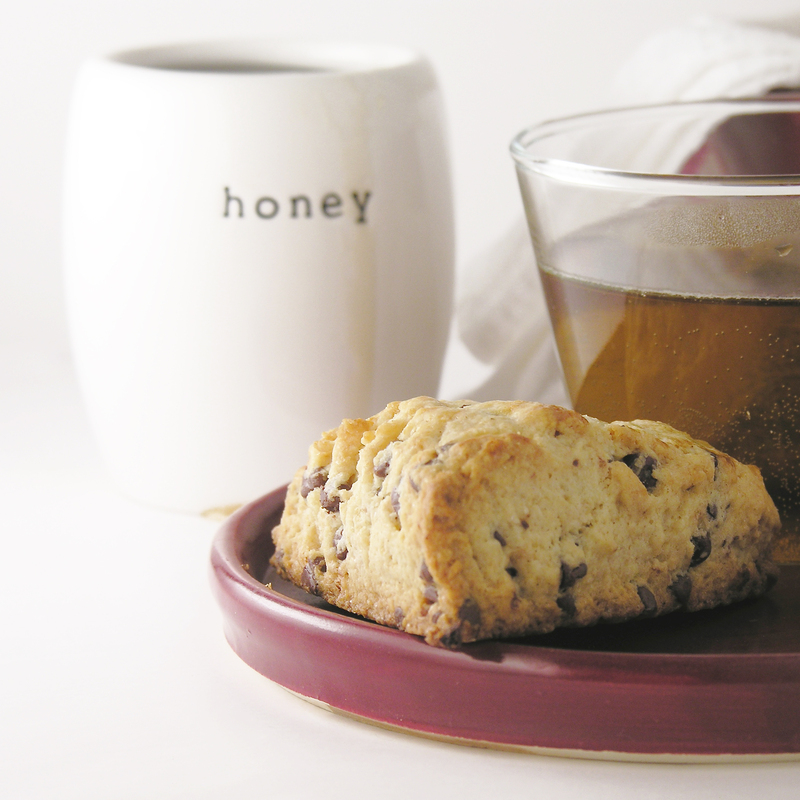 I started with a basic recipe for chocolate chip scones. I won’t tell you where I got it, because it wasn’t very good. At the time, I thought it must just be how scones are supposed to be (since I’d never tasted one before). Yuck. I was explaining my dislike for scones in a group of friends one night, and one family started protesting that they make the best scones ever. The mom (my friend Beth), got the recipe from her mother-in-law, who sold them in a tea shop she ran years ago. It sounded promising, and Beth sent me home armed with the recipe, tips and two scone pans (I didn’t even know those existed, but I LOVE them!). 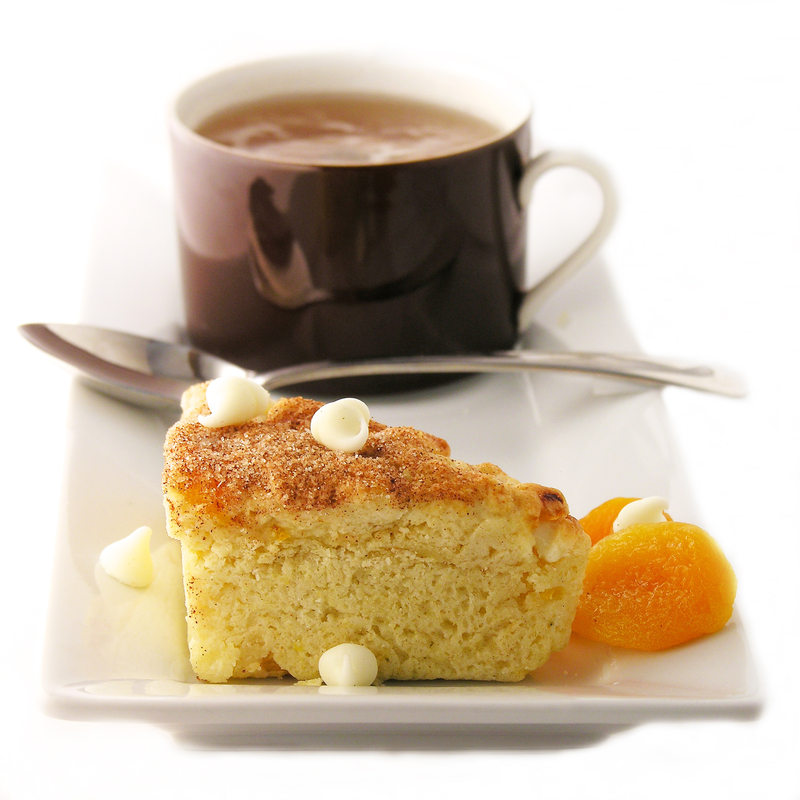 I started with Apricot White Chocolate Scones, and the rest is history. I love them. They are easier than cookies and so much yummier! You really need to have a pastry cutter (you can cut cold butter in with a knife, but it is SO much harder). You might also want to consider a scone pan . Those links will take you to products on Amazon, and if you get them I will get like 6% of what you spend. And then I will buy a scone pan for myself. *smile* If you want, you can cut the scones and bake them on a cookie sheet too- but they aren’t quite as moist and amazing that way. Sugar/ Cinnamon to sprinkle on top. Preheat oven to 400 degrees F, and spray pan (or sheet) liberally with cooking spray. 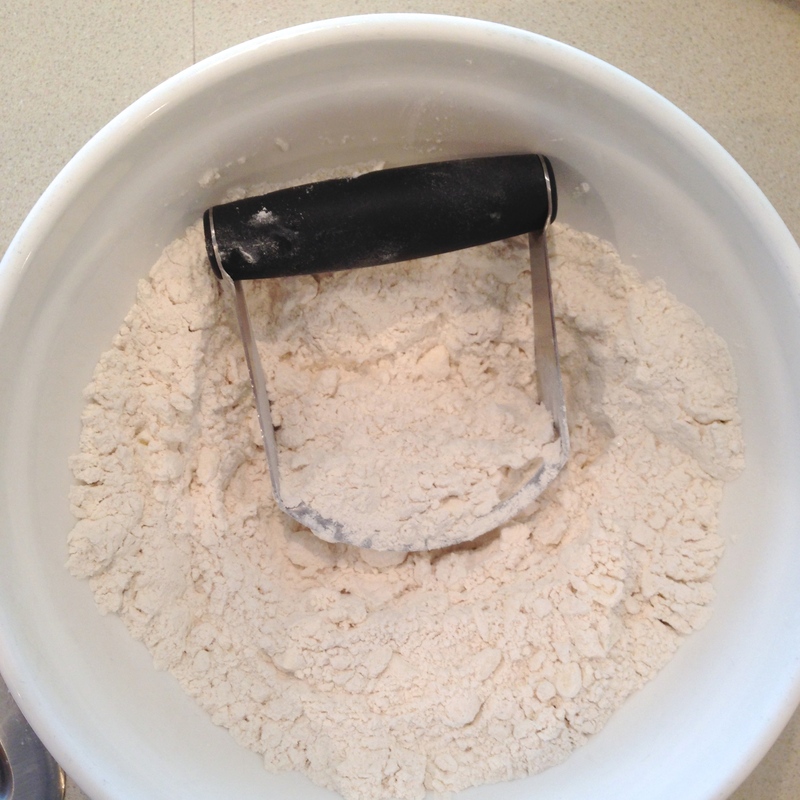 In a large mixing bowl combine flour, sugar, baking powder, and salt. 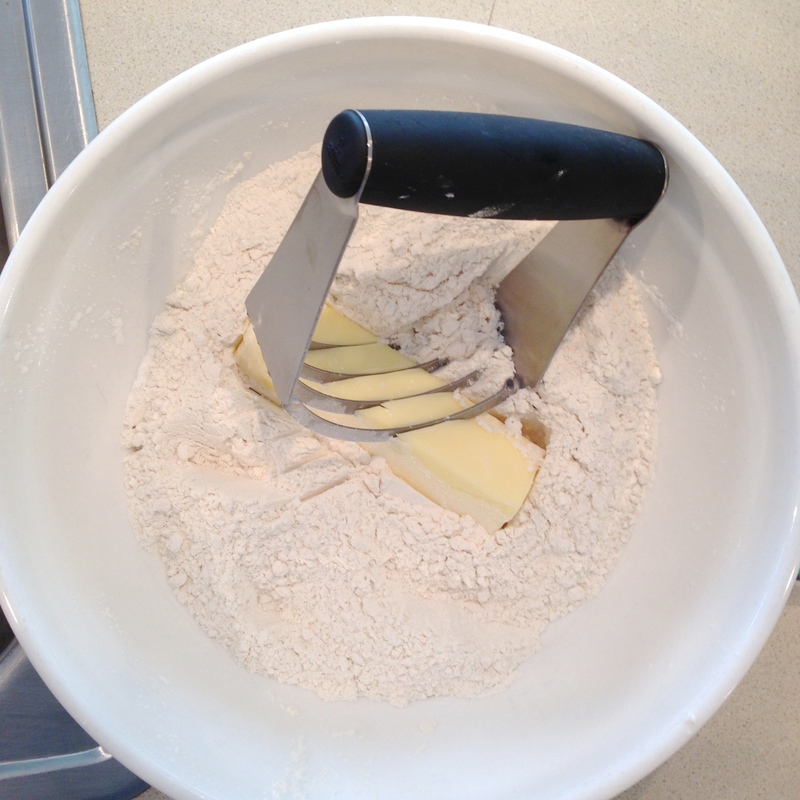 Add stick of butter and cut into crumb-like pieces using the pastry cutter. Add nuts or chips (if using) and toss together with dry mixture until coated. In a medium mixing bowl, mix together whipping cream and eggs until well combined. Add dried fruit (if using) and toss together with wet mixture until coated. 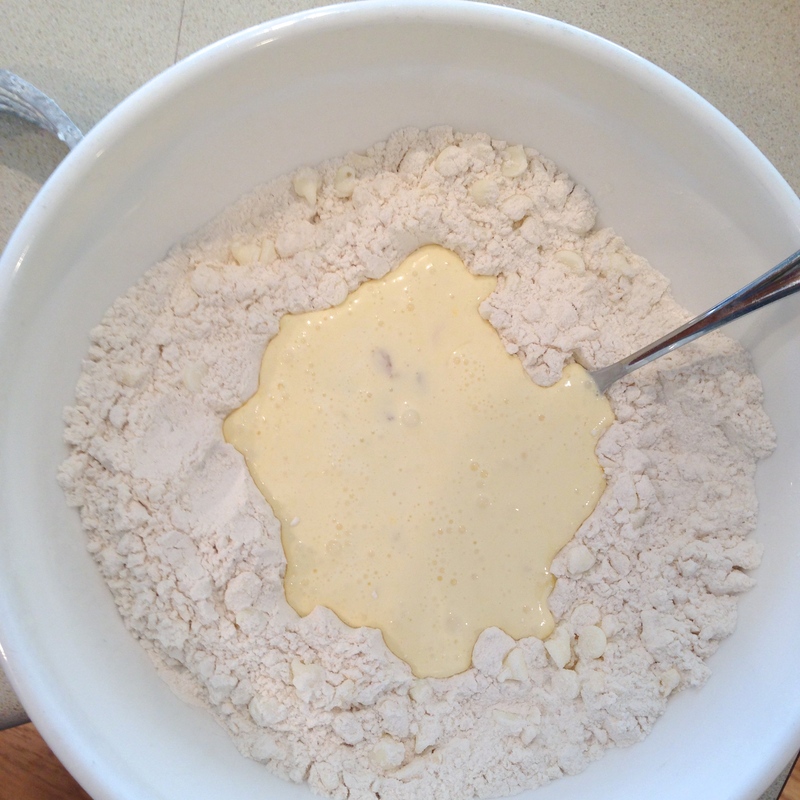 Make a “well” in the center of the dry ingredients and pour the wet ingredients into it. 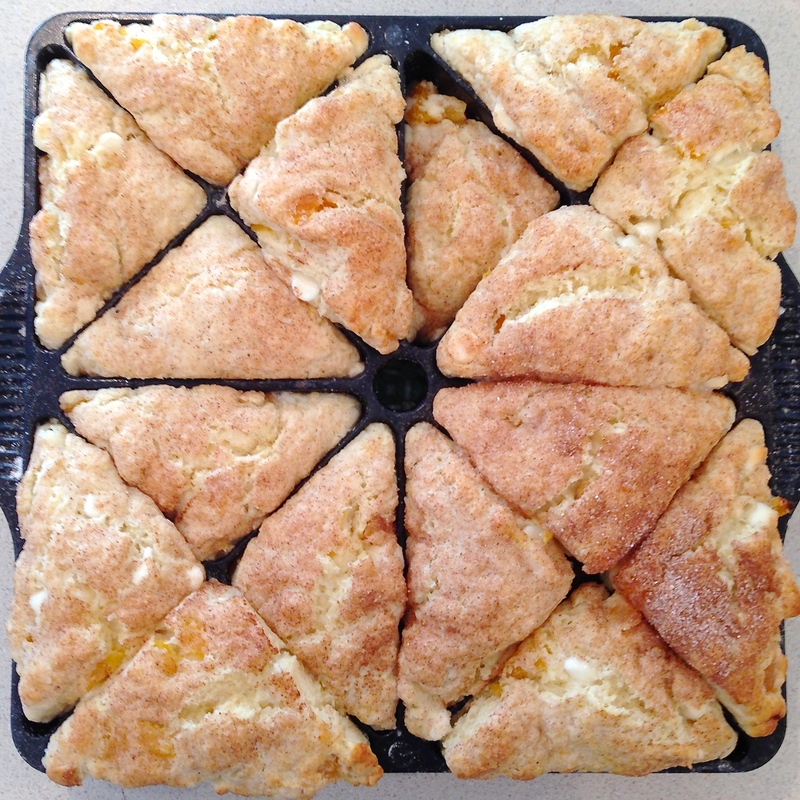 If using a scone pan, set aside about 1/4 of the dough to bake in a second batch. I overfilled my pan and they rose too high (as you can see in my pictures). When I made them for the shower, I used less dough and it was perfect! 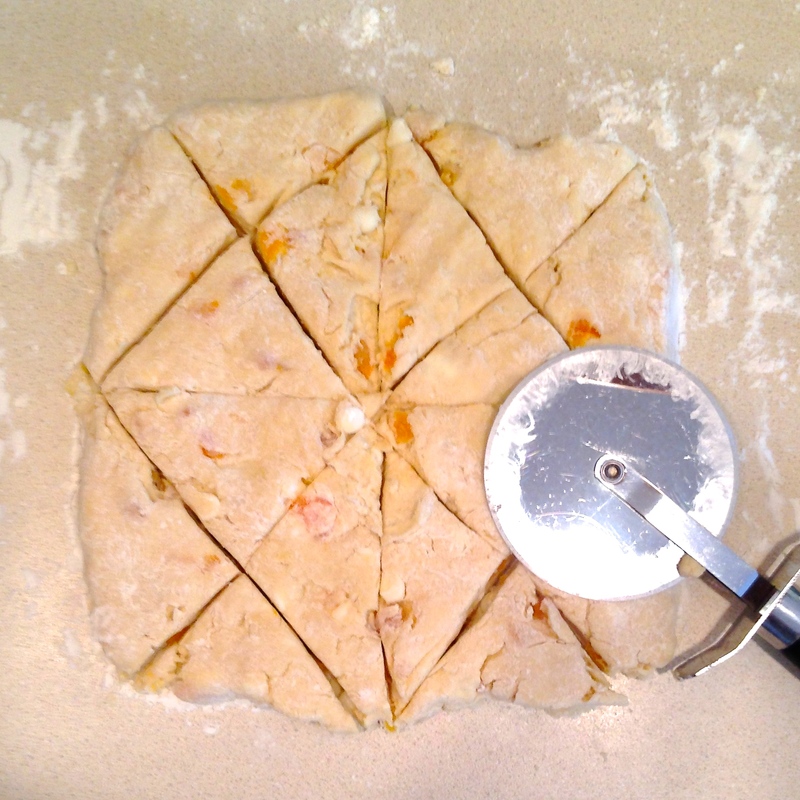 Press remaining dough into a square on a floured counter and cut into triangles as shown (I used a pizza cutter and a knife- both worked fine). Set into pan (or on cookie sheet) and brush tops with milk. Sprinkle with sugar (I used cinnamon and sugar). Bake at 400 degrees F for 12-15 minutes. Allow them to cool in pan for about 5 minutes and pop out with forks. My thoughts: Goodness…this sounds complicated, doesn’t it? I thought so too, but now that I’ve made a bunch of them I really do think they are easier than cookies! Today for the shower I made 4 kinds. I added white chocolate chips and apricots to the first (I cut the dried apricots into smaller pieces using kitchen scissors). I added dried berried (cherries, blueberries and cranberries) to the second. I added mini chocolate chips to the third, and I added Hershey’s cinnamon chips to the fourth. Posted in Pastry and tagged best, bridal shower, chocolate, chocolate chip scone, chocolate chips, dessert, easy, fruit, party, pastry, recipe, scones, white chocolate scone. Bookmark the permalink. 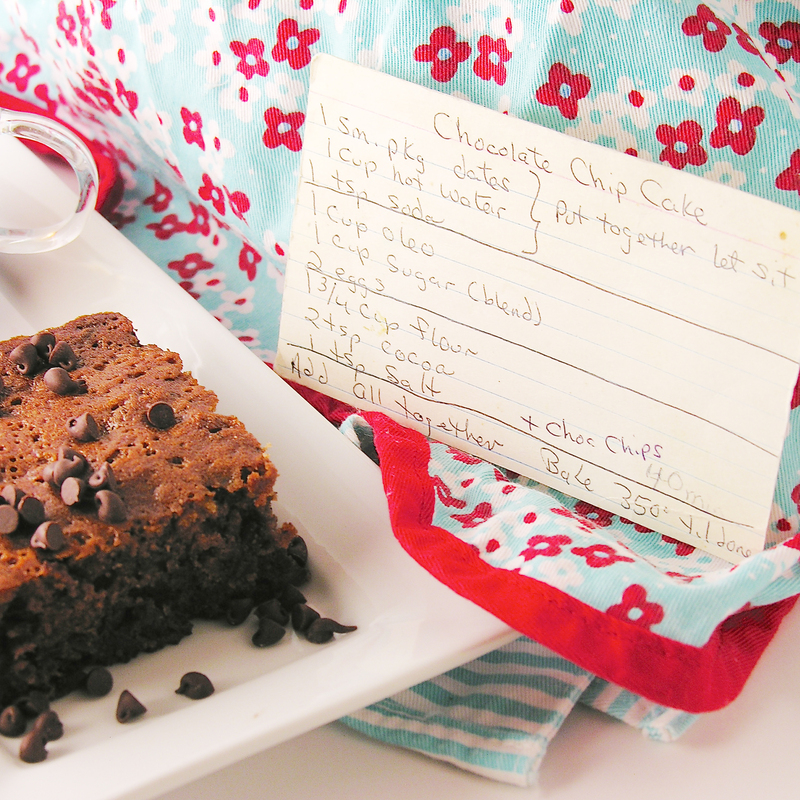 This delicious chocolate chip cake recipe is a tried-and-true family favorite and a go-to for a winning bake-off recipe! This recipe is my grandma’s, but my mom made it a lot when I was growing up. She didn’t tell me her secret ingredients until I loved it too much to care that there were dates in it. Man, do I hate dates. I’m not sure what happens to them in this recipe though- they are magically transformed into chocolatey goodness that doesn’t resemble dates in the slightest! 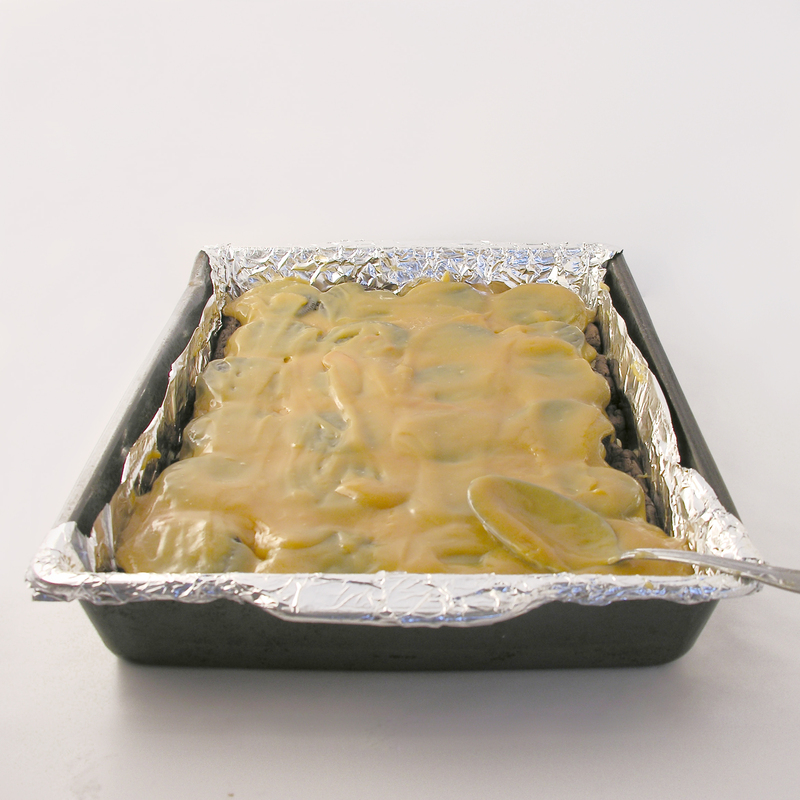 Preheat oven to 350F degrees and spray a cake pan with non-stick spray. In a medium bowl, combine the dates, water and baking soda, and allow the dates to soak while you put the rest of the ingredients together. Cream together margarine and sugar. Add eggs and blend together. Add dry ingredients (except for chocolate chips) and blend well. At the end, add date and water mixture. Blend well and add chocolate chips. Pour into cake pan and bake 40-50 minutes, until a tooth pick inserted in the center comes out clean. Our family recipe made me smile. Oleo (??) is margarine… and bake “til done” is nice too. Gotta love the way grandmas bake! This is my mom’s recipe card and she graciously added “40 minutes” at some point in the history of making this cake for us. Posted in Cakes and tagged best, cake, chocolate, chocolate cake, chocolate chips, dates, easy cake recipe, family recipe, holidays, recipe. Bookmark the permalink. 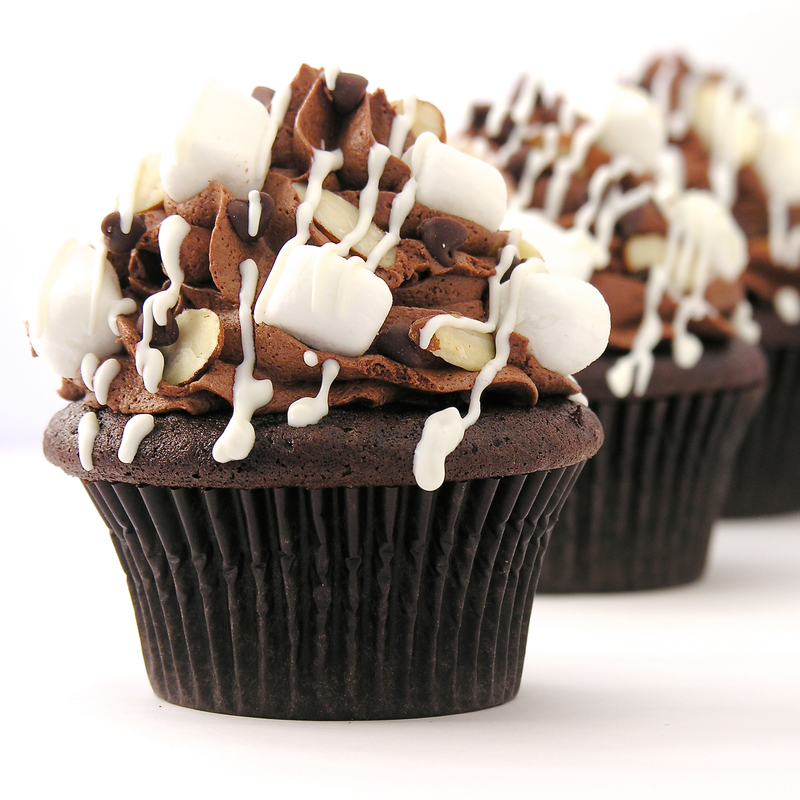 These chocolate cupcakes are filled with creamy marshmallow and topped with a rich ganache frosting, marshmallows and almonds! YUM!!!!! These are fork-eating cupcakes! 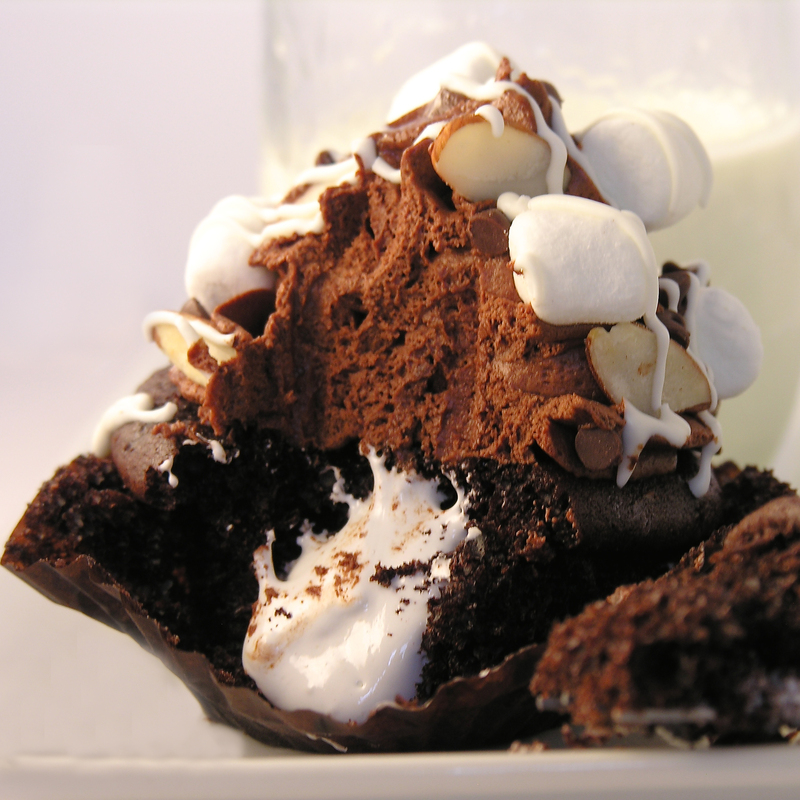 You’ll love that combination of rocky road flavors in these rich and messy-to-eat cupcakes. I absolutely love this frosting. I have used ganache for many recipes, but I’d never taken the time to whip it up into a frosting. Now that I’ve tried it, I will be back for more- this frosting is so rich and chocolatey!!! Ready for a recipe? Place 1/2 cup of whipping cream into a medium saucepan and heat it on the stove until the cream starts to bubble just a bit on the edges, stirring as it heats. Turn off the heat, add the chocolate chips and cover for 5 minutes. 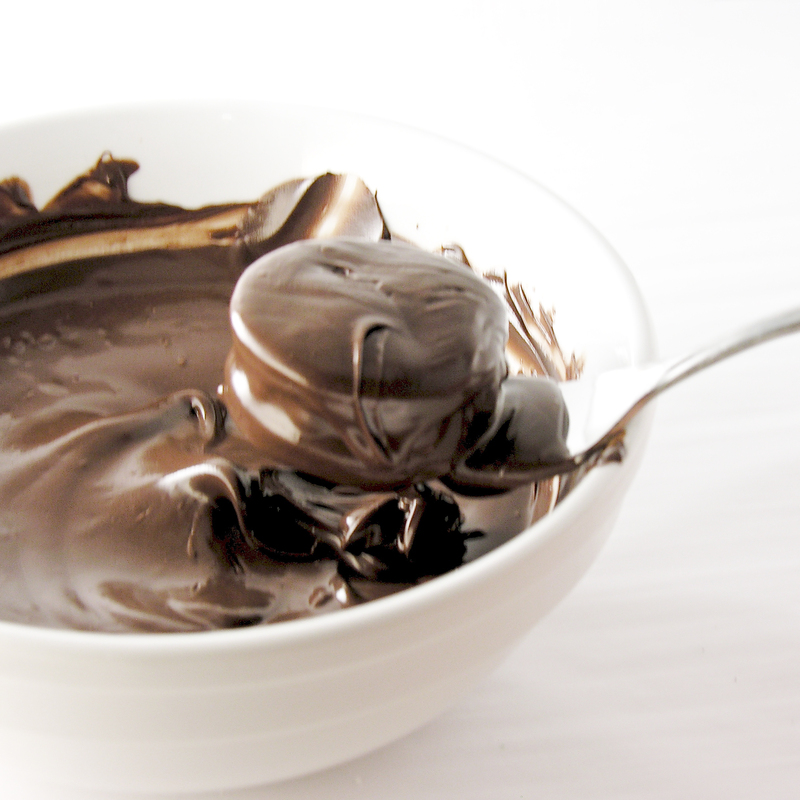 Stir melted chocolate and warm cream together until completely smooth (a “ganache”). Put it in a medium bowl and refrigerate until it is a cool, spoonable consistency (30 minutes to an hour). 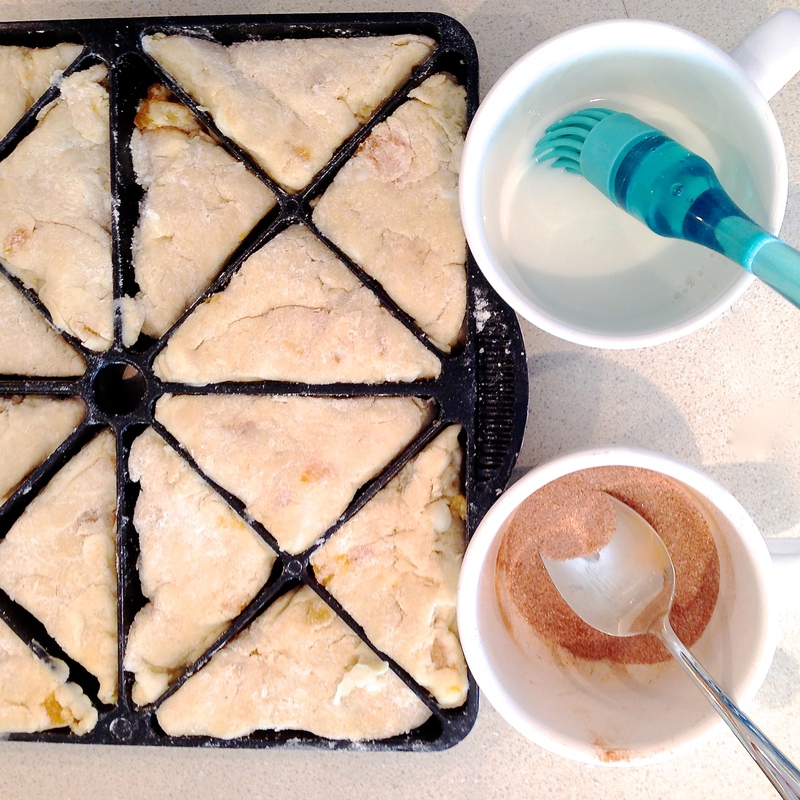 Make cake mix according to box, and divide equally into 24 cupcake lines placed in a muffin tin. Bake as directed on box, and cool completely. 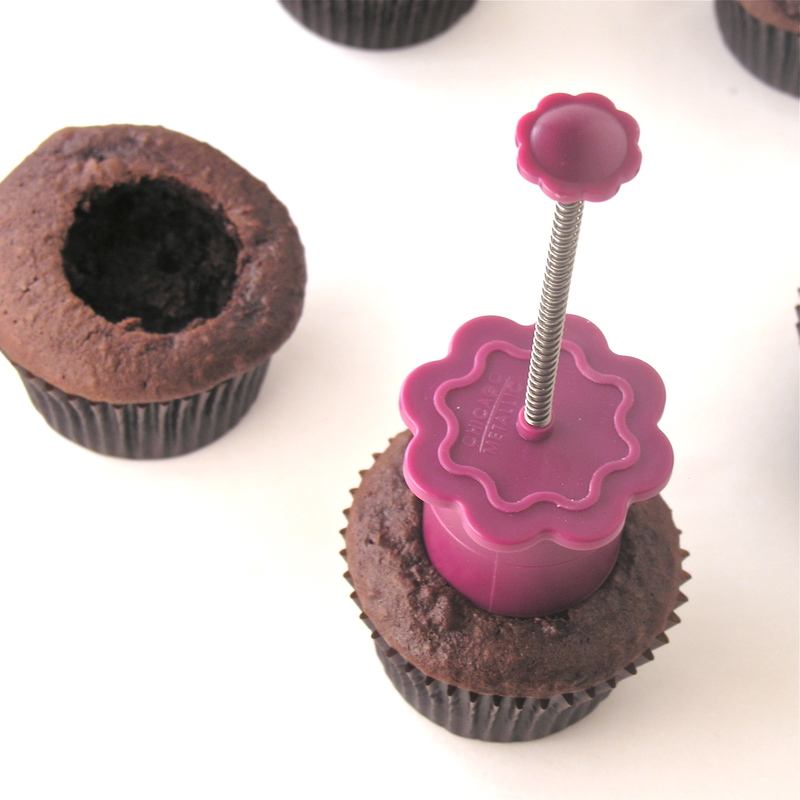 Core cupcakes using a small knife, or a cupcake corer . I used the Chicago Metallics one, and for $4 there is just no reason to not get one- it makes filling cupcakes SOOOO easy! Isn’t your birthday coming up??? Spoon entire jar of marshmallow fluff into a gallon-size zip-top bag and clip a corner off with scissors. Squeeze the marshmallow into the middle of each cupcake and then trim a little of the core you removed and place the “lid” back on top of the filling. 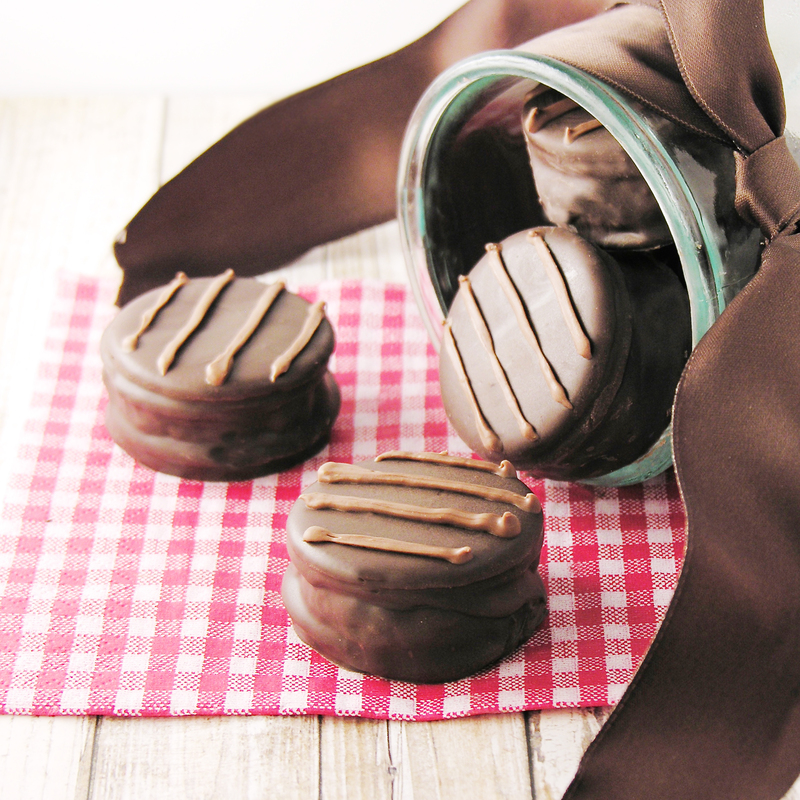 Remove cooled chocolate ganache from refrigerator and beat on high until light and fluffy. Place icing in a gallon size zip-top bag that has been fitted with a decorating tip in one corner, and pipe icing onto the cupcakes. Decorate with almonds, and mini marshmallows. I also added some mini chocolate chips (because I had some leftovers from another recipe) and I melted some white chocolate to drizzle on top. 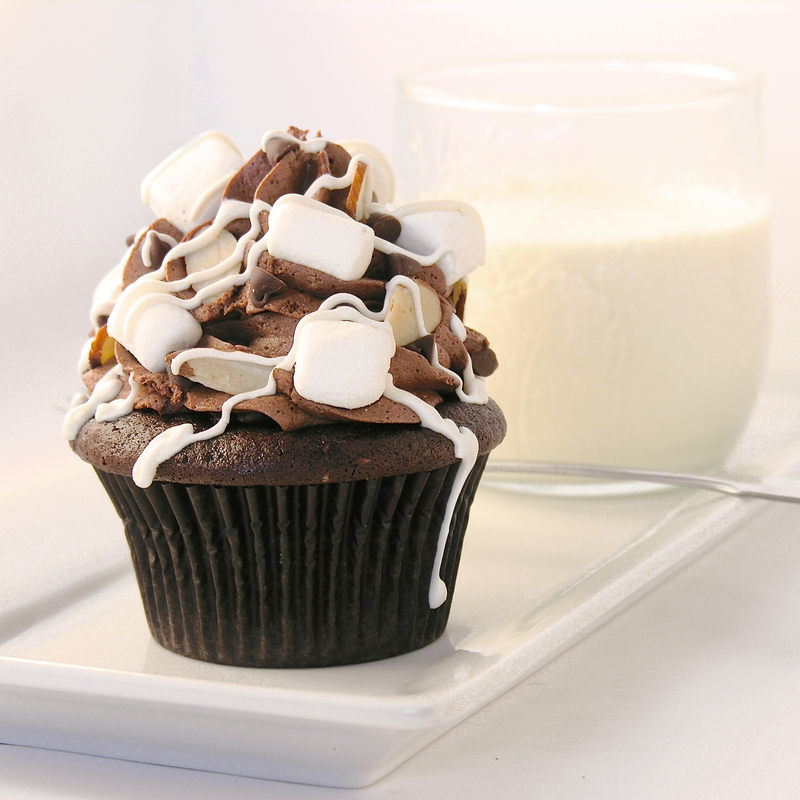 Be creative and make these little marshmallow-y cupcakes irresistible!!!! 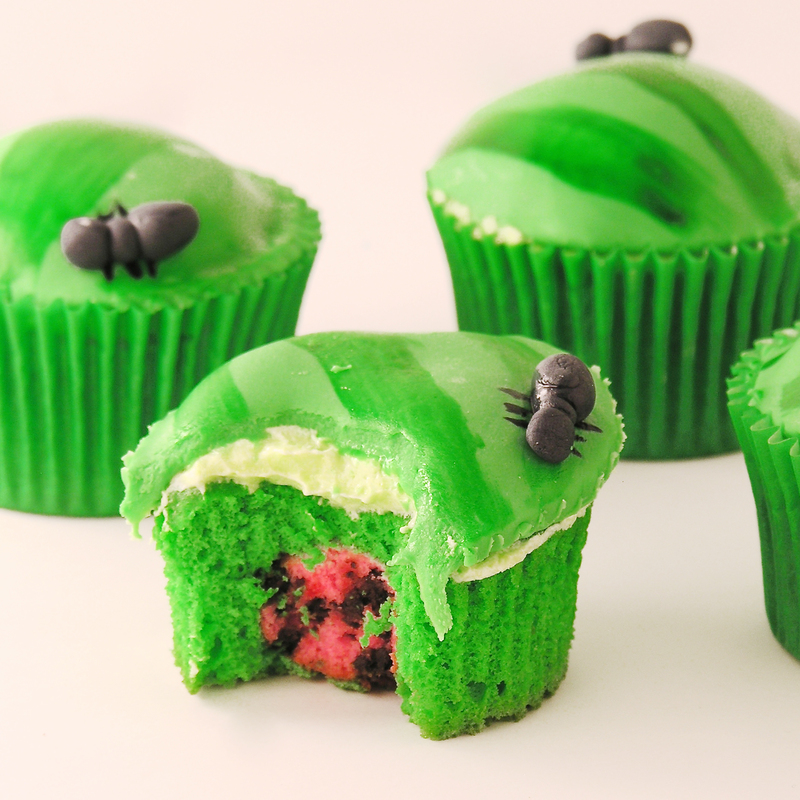 My thoughts: These are FABULOUS cupcakes. I love the gooey marshmallow creme surprise in the middle! 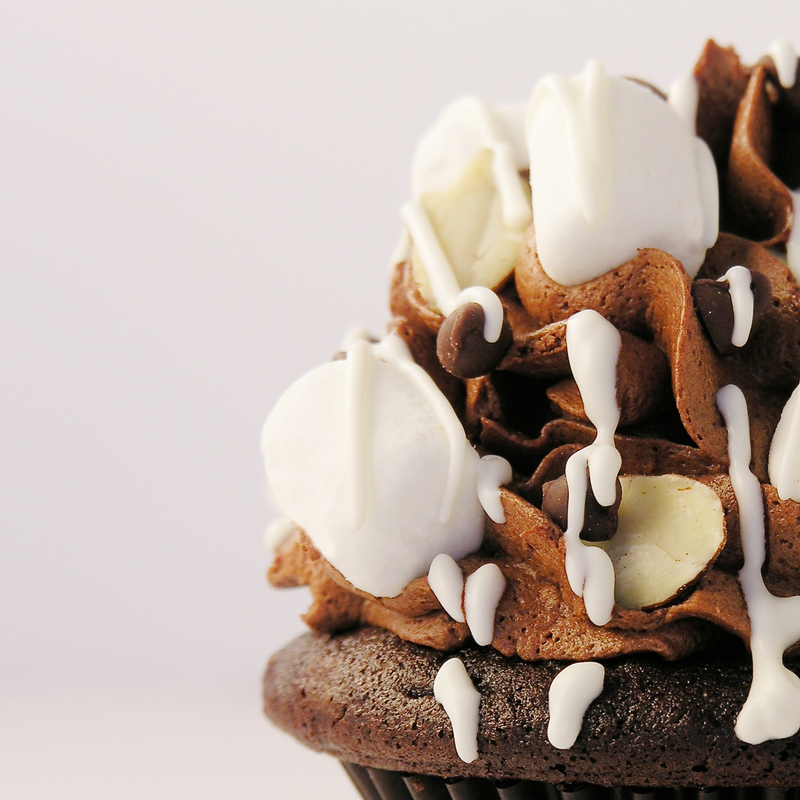 And that frosting….. oh my. A few tips: the frosting does harden up, so get those almonds and marshmallows placed in it as soon as you are done piping the frosting on. This is good, because it holds all those yummy toppings in place! Also, store these all sealed up. You know what happens when you leave the bag of marshmallows open? Yucky, rubbery, dried up marshmallows! The same will happen if you just let these set out. Posted in Cupcakes and tagged almonds, baking, best, chocolate, chocolate chips, cupcake, cupcake corer, cupcakes, dessert, fancy cupcakes, filled cupcakes, frosting, ganache, marshmallow, recipe, rocky road, unique dessert, whipped ganache frosting, white chocolate. Bookmark the permalink. 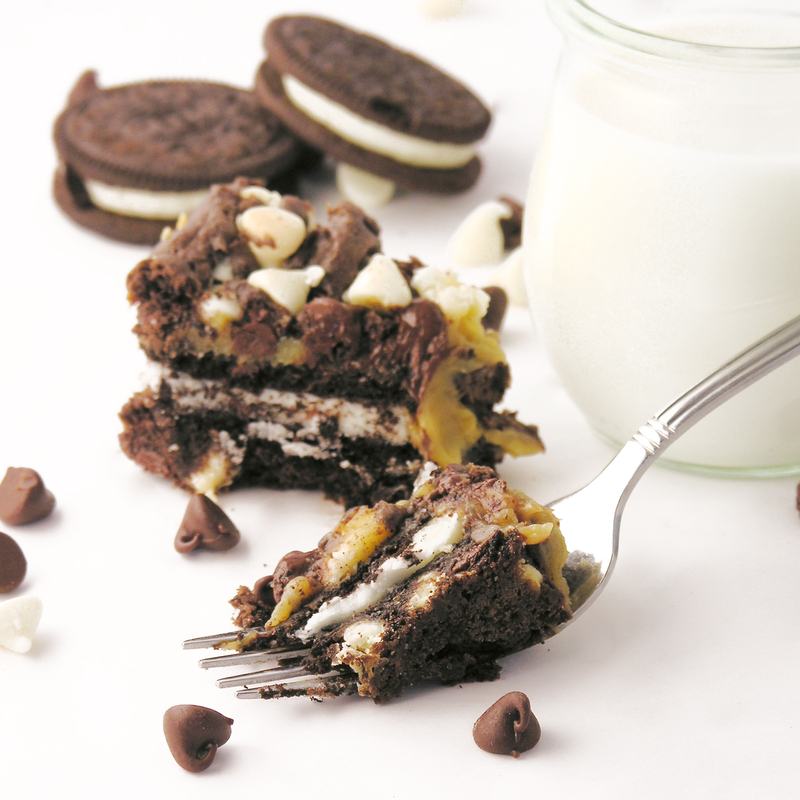 Rich and gooey, these brownies are filled with soft caramel and Oreo cookies. Does dessert get any better than this?!? Wow…this was an experiment, and I’m almost speechless about how good these are. 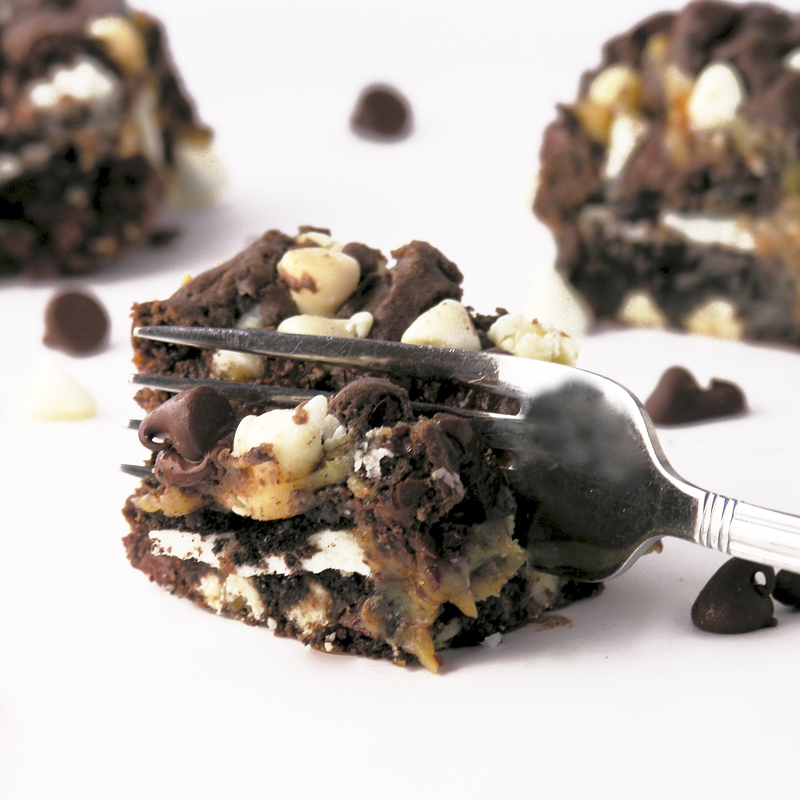 It is hard to describe the yumminess…You need to try these. 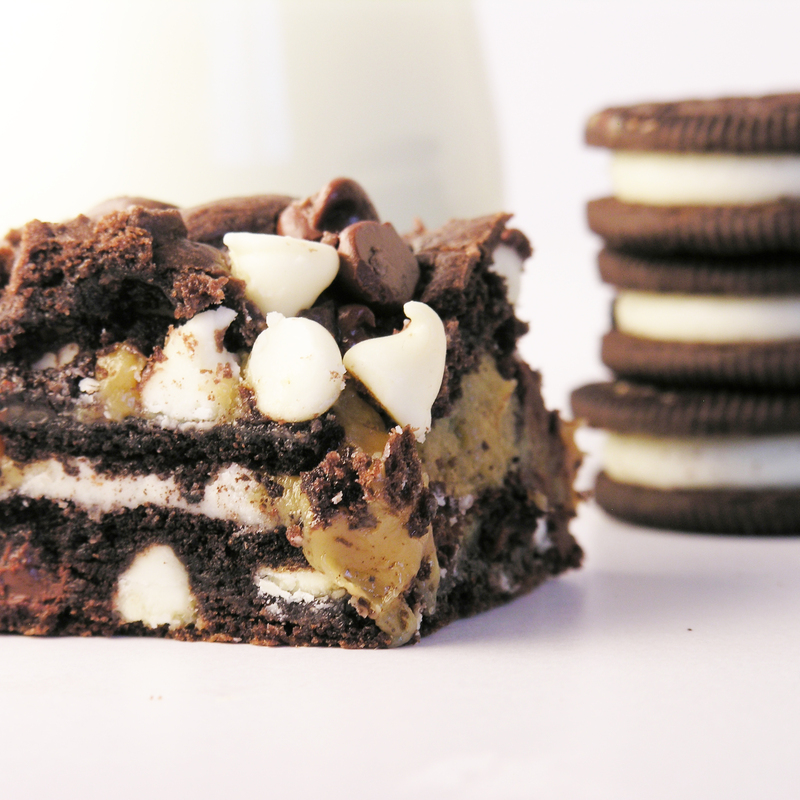 I need to make these again, because they are already gone. 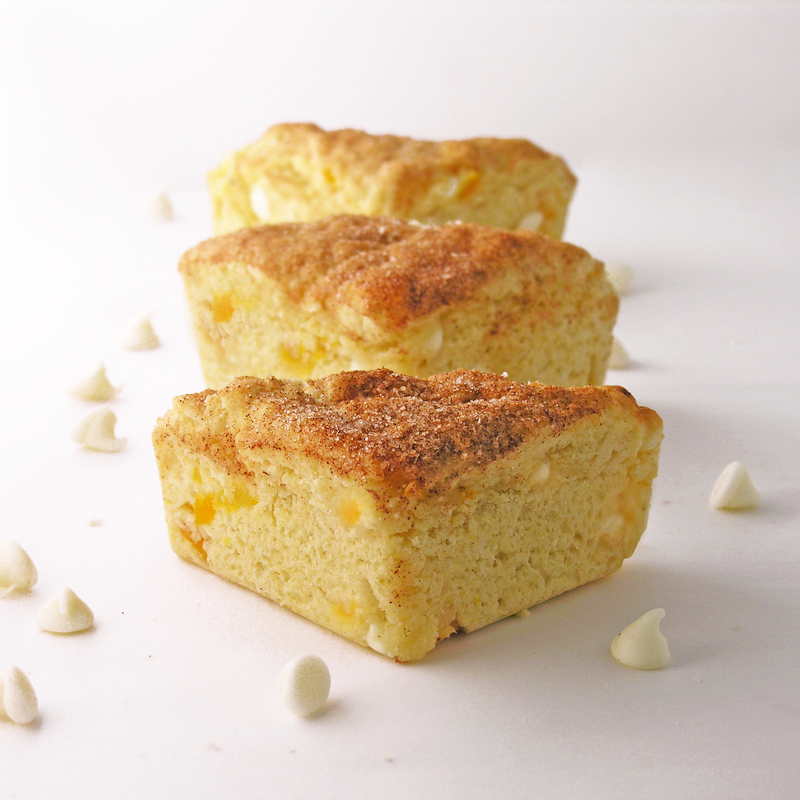 I’ve shared this recipe before on Easybaked, a very long time ago. 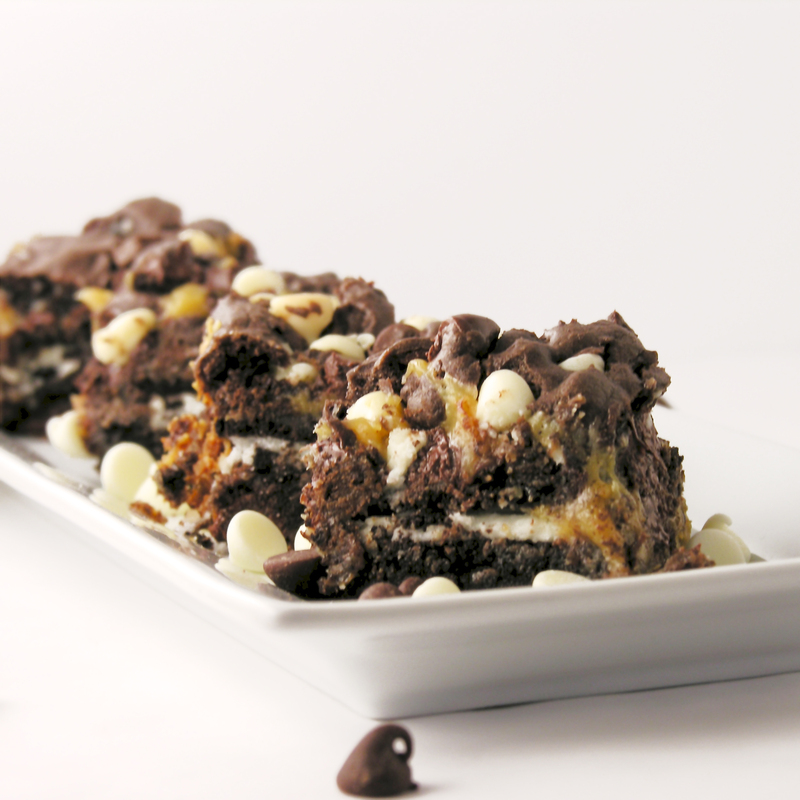 It is a wonderful recipe I called caramel chip bars. This was one of my very first recipes on this blog, and if you click on the link you can see the recipe AND my awful beginning photography!!! Lol. 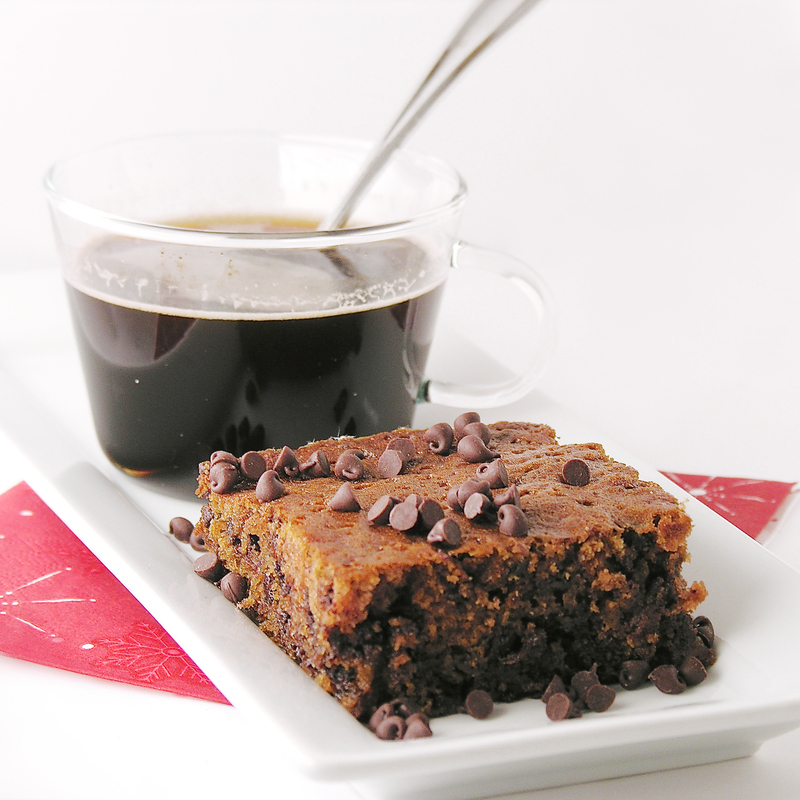 These are very versatile brownie bars. I make them all the time with a variety of cake mix flavors and chips. It is a perfect way to use up half-empty bags of chips. 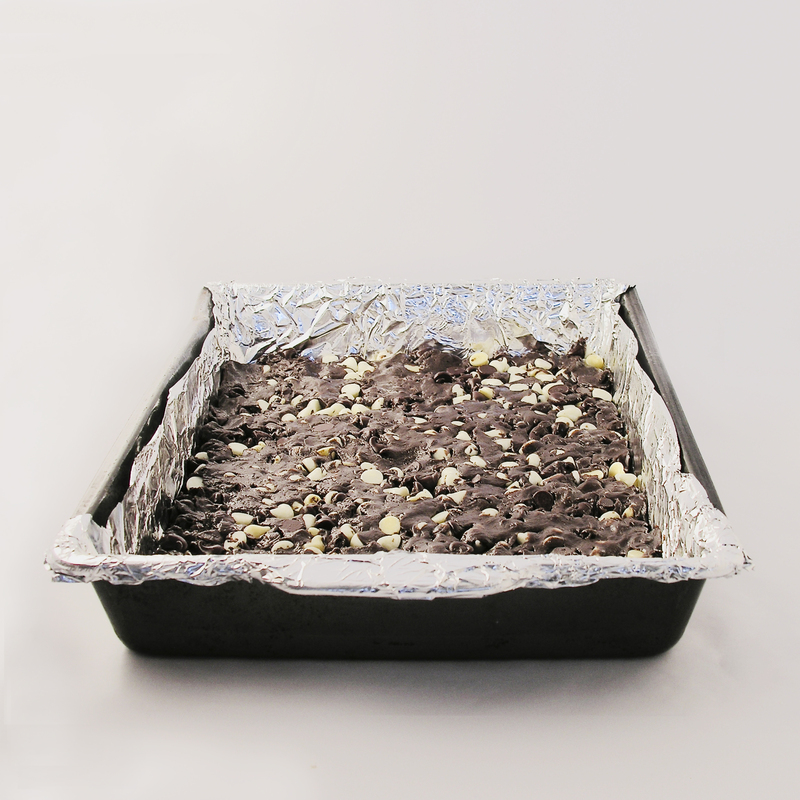 Line a 9×13″ cake pan with foil. Combine cake mix, oil and eggs. Blend well and stir in all of the chips (mixture will be very thick). Press a little less than half of the mixture into bottom of pan (it will press into a very thin layer and you might be able to see the bottom of the pan, but when it bakes it will fill in). While this is baking, in a medium saucepan, combine butter, caramels and condensed milk. When cake has baked for 10 minutes, remove from oven and place 24 Oreo cookies over the top of the partially baked cake. Top with remaining cake/chip mixture. There is a technique to this- you cant just spoon the batter on top or it will just mix in with the melted caramel. Instead, take a small ball of dough/chips and press it very flat between your hands. Lay this on top of the caramel and repeat the process, like a patchwork quilt, until the entire top is covered. It is ok to have a few gaps. Bake an additional 25 to 30 minutes. Remove from oven and cool 20 minutes. Gently lift from pan and peel foil from edges. Cool completely before cutting. Makes about 24 bars. My thoughts: You have to make these!!!!!!! YUM!!!!! 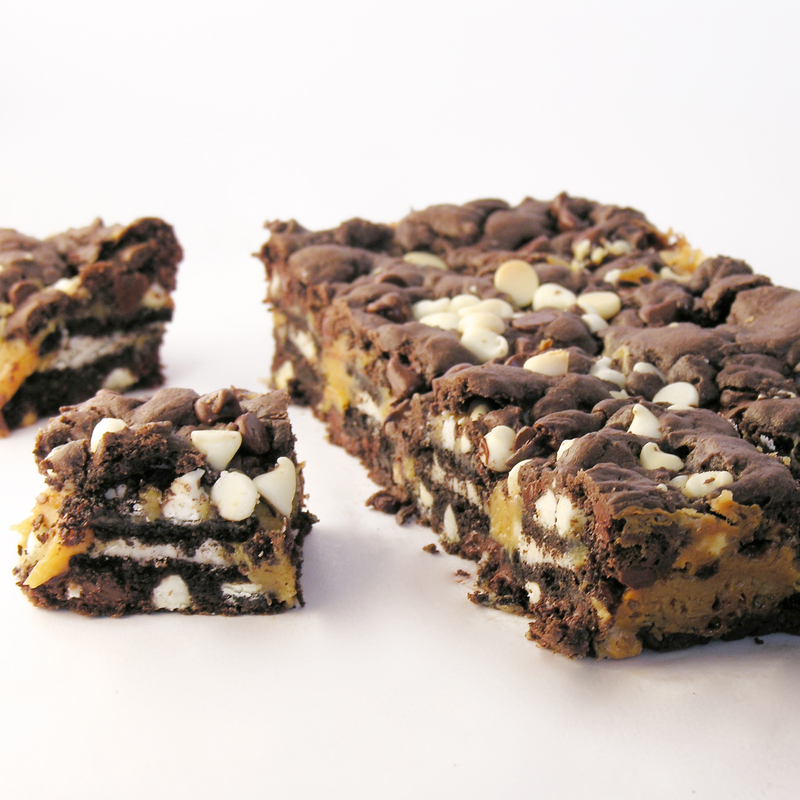 Posted in Bar cookies, Brownies, Candy, Cookies and tagged amazing, baking, bar cookies, best, brownie, cake mix, caramel, chocolate, chocolate chips, decadent, delicious, dessert, Kraft caramels, layered bars, oreo, Oreo dessert, recipe, rich, white chocolate. Bookmark the permalink.